This is the first report of the research I am doing towards creating a Wisdom Interface. The goal of this interface is to generate moments of insight during everyday activities. In order for these wisdom interventions to be effective I have to know what would be the best location to stage the interventions. For an intervention to be effective the users’ mind has to be more focused and relaxed than it usually is. Everyday consciousness often is a state of distraction and daydreaming. People sometimes also suffer from hindrances like aversion, anger, sorrow or sleepiness. Both states are not ideal for intervening because the mind isn’t ready for receiving insight. Ideal would be for the user to be at least relaxed and attentive or possibly concentrated. My research question for designing and conducting this research therefore was: What are the different mind-states people experience in the rooms and places in their own home? The possible mind-states besides everyday consciousness were: hindrance, relaxation, attention, concentration and insight. I asked participants to look back and log their state of mind every time they left a room. They could participate for one up to three days. 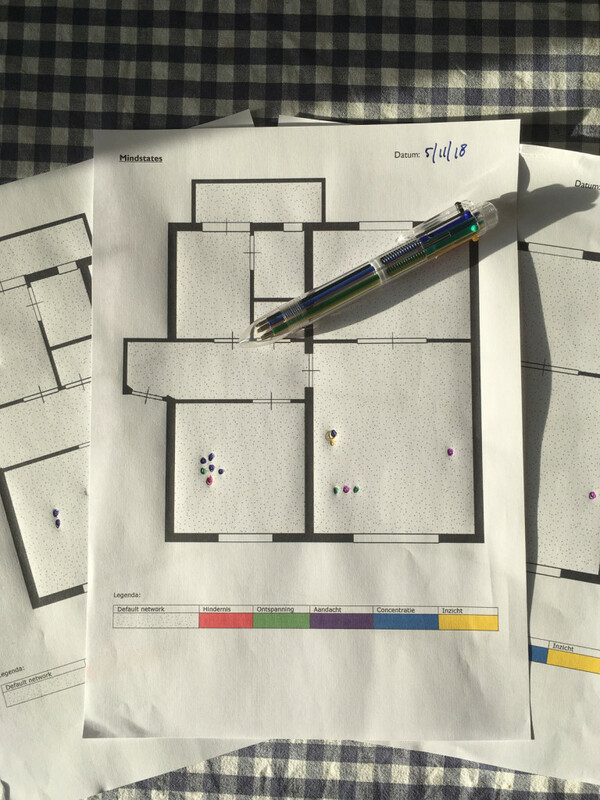 I have used the personal inventory method to collect mind-states and locations in their home. To make mapping easy I first asked the participants to draw a map of their home. From that I created a digital version with empty rooms so the participants had room to mark their states. Participants would print one map for every day they logged their states. The map also included instructions. In a legend I assigned a colour to each mind-state. I supplied every participant with a multi-colour pen so they only needed one tool to log. Logging was done by creating a clear dot on the map in the appropriate colour and at the right location. I first did a three day logging myself. 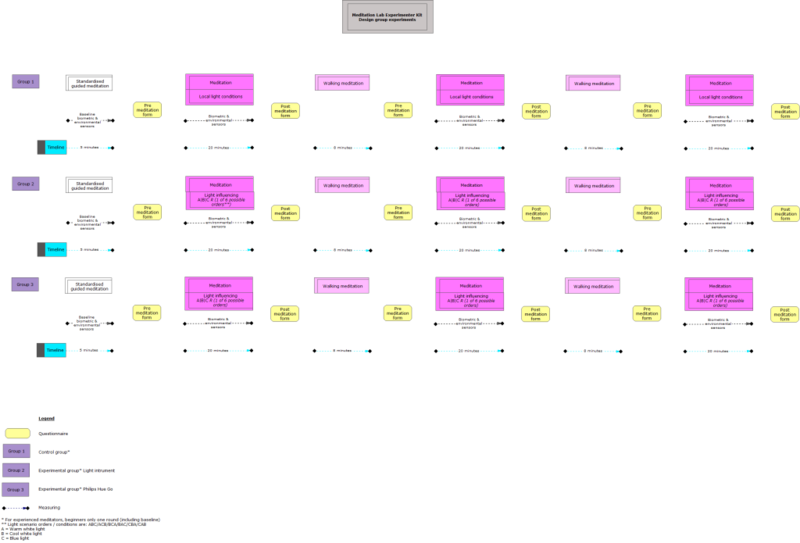 I was surprised at the outcomes and also found the logging itself an insightful activity. I then asked five other people to log for one to three days. All are between 30 and 50 years old. Most had experience with meditation or yoga and were interested how logging their mind-states could create more self awareness at home. This was of course not the question but a nice by-product of this method. It struck me how hard it was to get responses from people. First for collecting the drawings of their homes and then to get the actual logging results. It took me two months before I could generate a combined map. One person didn’t send in any results. In total I could work with results from five different people, myself included. I had a total of 11 days of data. Two participants logged three days, two logged two days and one logged one day. I realised that the homes of my participants were very different. So I made an inventory of all the rooms and created a map of generic house to plot all the logging. I used the software program Adobe Illustrator for both creating the map and to map all the mind-states manually. This way I have created a heat map from which it is instantly clear what the prevalent mind-states in the various rooms are. 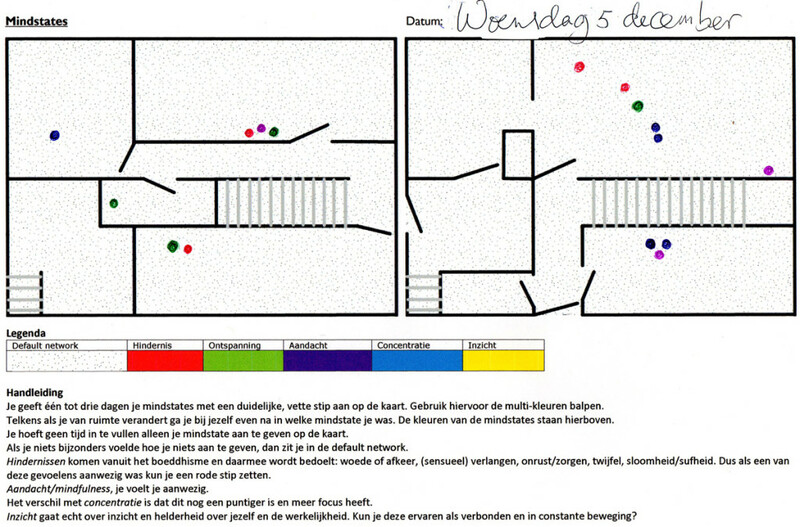 Generic house with heat-map of 11 days of logging using data from five participants. 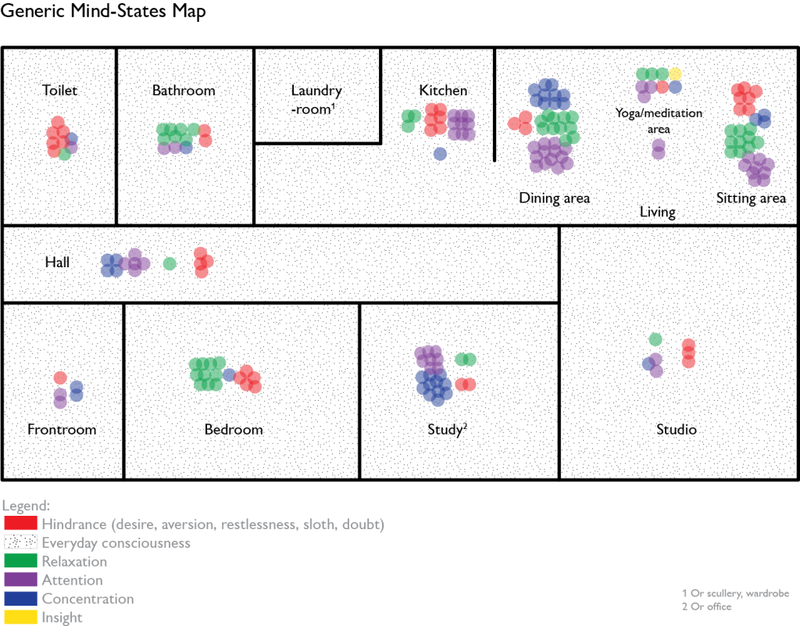 Some rooms yielded the expected results: there was mostly a relaxed mind state in both the bedroom and the bathroom. Although relaxation is a prerequisite for insight I think that this kind of relaxation is more related to sleepiness and sloth and not a good starting point for an intervention. Users should feel relaxed but not to the point of sleepiness or indifference. The same holds true for the sitting room. Sloughing on the couch is not the same as a deep sense of relaxation. Besides in the sitting area also a lot of hindrances occurred. Yoga and meditation area’s unsurprisingly do create the right mind-states. So it will be useful to include or create some sort mindfulness activity or setting with the intervention. Another obvious candidate is the study/office. There is a lot of attention and concentration while being at work there. The challenge will be how to not disturb the flow of working while at the same time taking advantage of the right state of mind. As stated earlier some results were really surprising. Sitting or standing and interacting with food seems to create a good mix of attention and relaxation. The kitchen and especially the dining area show a rich set of useful mind-states. With the dining area also showing a lot of concentration. Interesting areas are the toilet and hallway. The loggings on the toilet were also a surprise for me. Personally I feel very neutral about visiting that room. But a couple of different participants had some strong feelings about the toilet, mostly negative. So even though one is sitting or standing quietly for a few minutes I doesn’t seem the right place to intervene. I find the hallway interesting because it is a place of transition. Coming into the house or going from one room to the next. It is a place to reset you mind. People are also in motion. It actually is a place where different activities interconnect and it is also unstable because of the movement and being in between rooms. These are natural properties of this space that are worth exploring further. The focus of this research was on locations at home and the mind-states they promote. My next step will be exploring at what time and during which activities useful mind-states emerge. I will be using the experience sampling method to keep track of them. This spring I wrote this article together with designer Vera de Pont. It was presented at the “Searching for the New Luxury” conference by the Fashion Colloquium. Unfortunately it will not be published in their journal. But we had a nice time writing it and we hope the content is of use to others. In this article the authors will explain the different, layered ways in which use of the wearable Silence Suit can be considered a new luxury. The main luxury is empowerment through giving awareness and control to the user supported by embodiment and transparency. After explaining the system of which the wearable is part and the context from which the concept arose the life cycle of the wearable is used to explain how interacting with the suit offers many opportunities to experience a new sense of luxury. 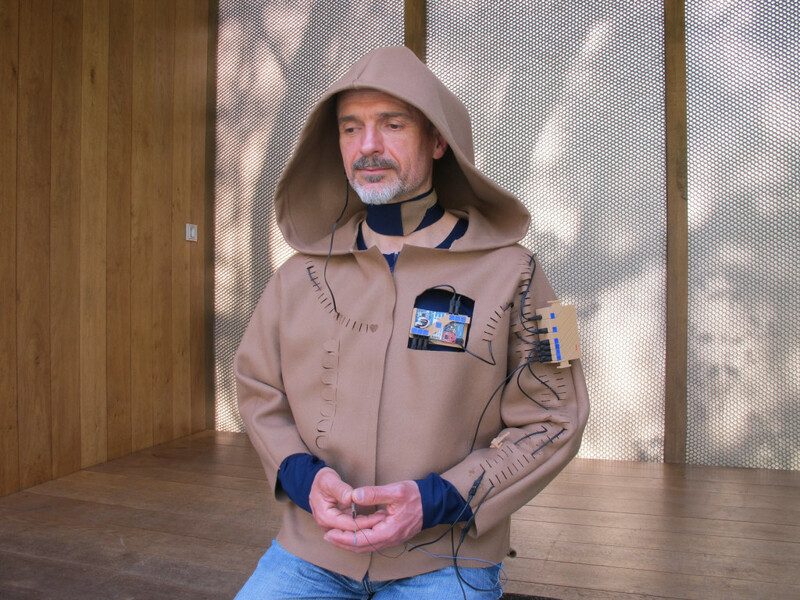 The wearable Silence Suit is part of Meditation Lab Experimenter Kit, a system which enables users to experiment with their meditation practice and improve it through insight and direct influence of the environment. 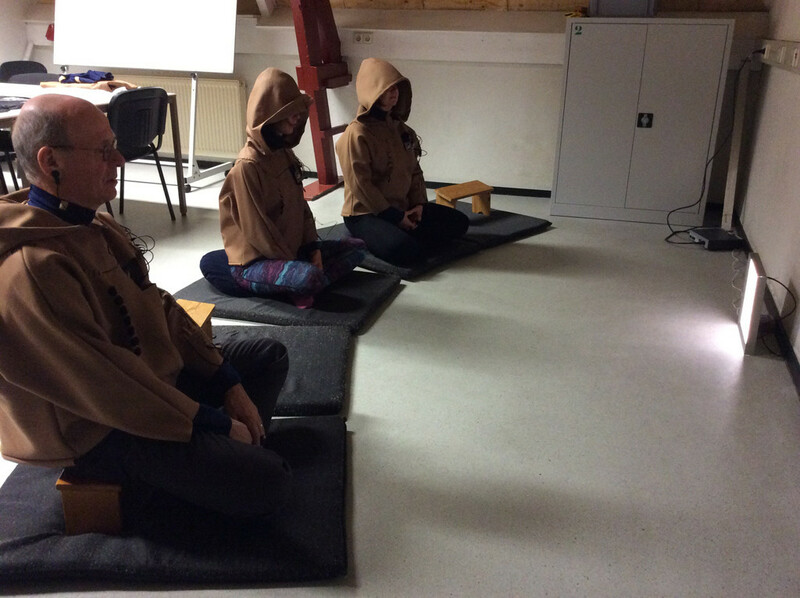 With the wearable users can collect biometric and environmental data during the meditation session (Figure 1). 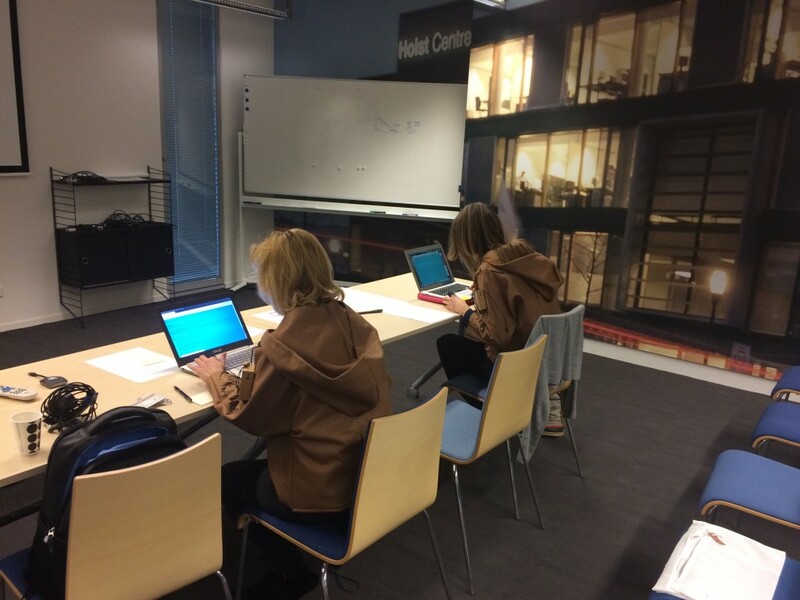 The quality of the session is assessed using pre and post meditation questionnaires. Both data sets are fed into a learning system which determines which environmental variables have the most positive effect on the meditation quality. Through Internet of Things technology, the light in the environment is changed automatically depending on the meditation-quality predicted by the system. This system is geared towards helping individual users improve their practice by giving them a toolset to conduct their own meditation experiments, get insight through exploring their data, and by actually optimising the environment for higher quality meditation. Danielle Roberts, artist/designer/innovator is the initiator and conceiver of the Kit. She has maintained an intensive meditation practice for over 20 years. She is also a self-tracking enthusiast and tracks health and lifestyle parameter on a daily basis. Both practices have shown her that increased awareness allows her to grow and flourish in a compassionate way. In her work she explores ways through which contemporary technologies can support this. Roberts’s vision is to create the optimal home which will support a spiritual, productive, healthy and sustainable life: Hermitage 3.0. Being able to measure its’ inhabitant is the first step towards realising this holistic living environment. 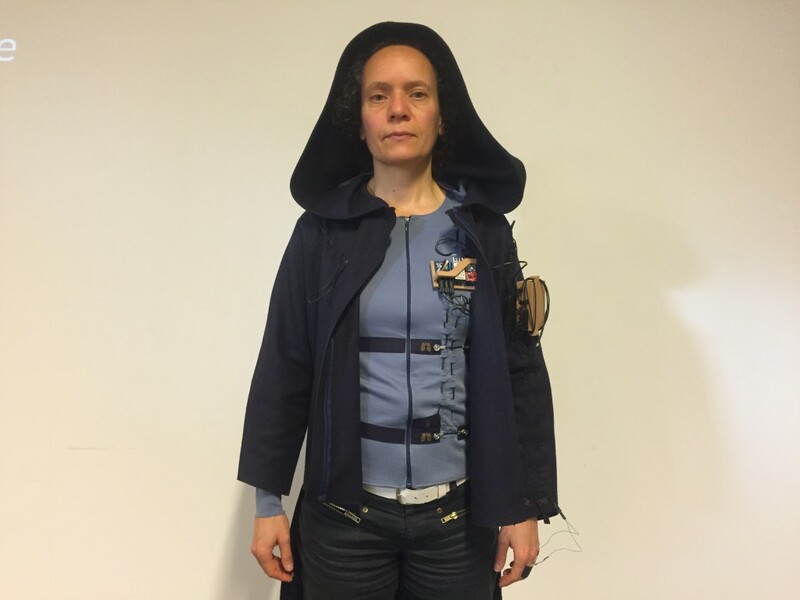 In 2015 Roberts started building the wearable Silence Suit. In 2017 the opportunity arose to apply with this first prototype for the WEAR Sustain open call. This was issued by the European Commission to promote collaboration between creatives and technically skilled people to work on ethical and sustainable wearables. Roberts was one of the winners. 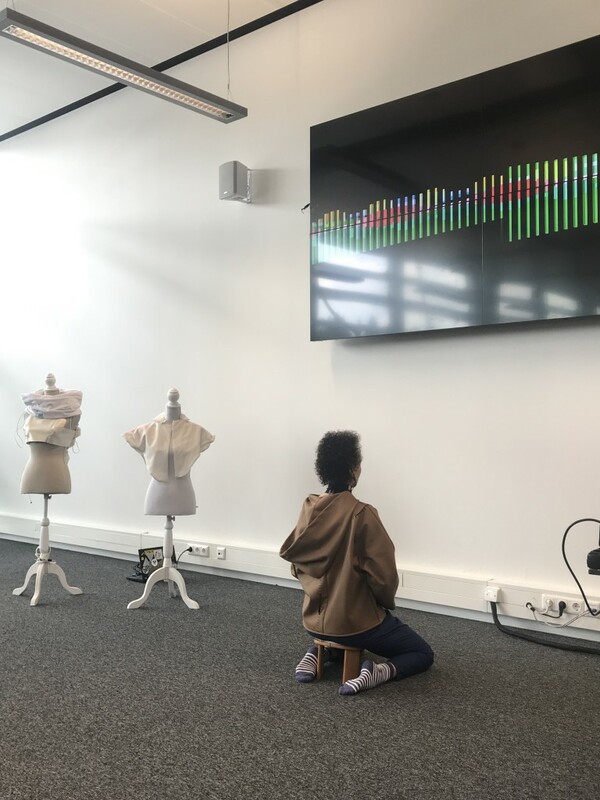 Together with a team she designed and produced 5 wearables in 3 sizes and custom software was developed that allows users to create and analyse their own meditation experiments. In recent years digital fabrication and specifically 3D printing and laser cutting as both creative and manufacturing tool has received much more widespread adoption. As enabling technology this facilitated a whole new range of self-assembly designs generated from digital files that are often presented as Open Source files to be customised and controlled by the end user. The Silence Suit is designed with the Open Source philosophy in mind. 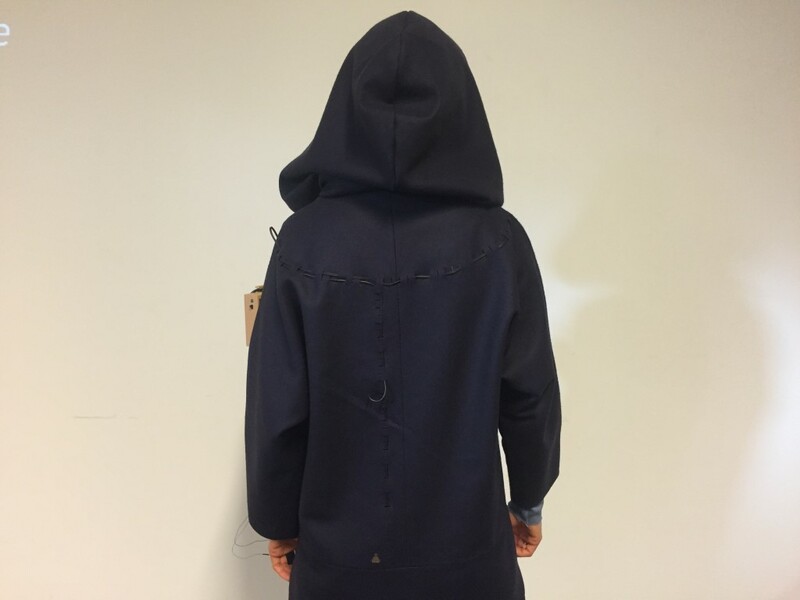 The open approach to the garment’s production ensures a garment design that is accessible, manufacturable and upgradable by whoever chooses to do so and makes it producible with a limited amount of machines in local workspaces and fablabs. Users become aware of the process of production and the parts of the suit. With regards to the production of the Silence Suit, the aim is to develop a system where the level of end-user assembly is chosen by the end user themselves. Ranging from the level of complete individual production in local production facilities, to the level of end user assembly with pre-produced parts. The transparency of self-assembly and the embodiment during local production constitute a new luxury which empower the user. At every stage of the life cycle the design and use of the system create for the user to experience the system properties embodiment and transparency. Which may produce control and awareness for the user. These properties and mind-sets interact and result in empowerment of the user. In this section this will be highlighted for every phase of the life cycle. A. Hard-core makers: Start from scratch and completely assemble and / or modify every aspect of the suit including the electronic parts. B. Maker apprentice: Has some knowledge of the techniques involved but needs guidance in for example a workshop. C. Meditator: Start from a semi-finished product. No soldering is required but the parts must be placed at the proper positions and connections. D. Use a finished suit: no assembly, the user only has to put on the wearable. The design isn’t aimed at this type of use but it is imaginable in scenarios like meditation workshops or rental. The following describes option C. This is how the parts were delivered to Roberts on first use. To prepare the garment for use, it’s produced modular parts will have to be assembled. This includes the hardware pieces that have to be located on specific locations on the suit, as well as weaving the cables and attaching them to their respective hardware pieces. To ensure a relatively short assembly time and correct end user assembly, the garment is designed as a manual for use. The suit contains engraved symbols which showcase the positioning of the sensor pieces. This helps the user to assemble the parts correctly while leaving the user free to weave the cables to her liking through small openings in the fabric. This tangible interaction with the suit can be a mindful action which aims to create a bond with the garment and raise awareness of all the parts that the suit contains. The design process was aimed at solving these conflicting interests by carefully looking at the interaction between the user and the garment at various steps during use and stages of the life cycle. The ‘perfect fit’ is relative to the way data can be optimally collected and the aesthetics of the garment is influenced by the way the garment will be used. For example the Galvanic Skin Response Sensor (Figure 2), which is positioned on the upper arm and needs direct contact with the skin for optimal data collection. A conscious choice was made to develop the Silence Suit in 3 standardized unisex sizes (EU small/medium/large) to fit a multitude of people. Where tight fit is needed adjustable straps are provided for. These simple Velcro straps afford personalisation (Figure 3). The user can control the tightness for optimal balance between comfortableness and good measurements, as with the detachable neck piece carrying a posture sensor. The sensor is positioned within two layers of stretchable fabric, making sure that the placement is fixed and close to the skin without feeling stiff. The tight fitting bottom layer feels soft to the skin, kindling awareness. 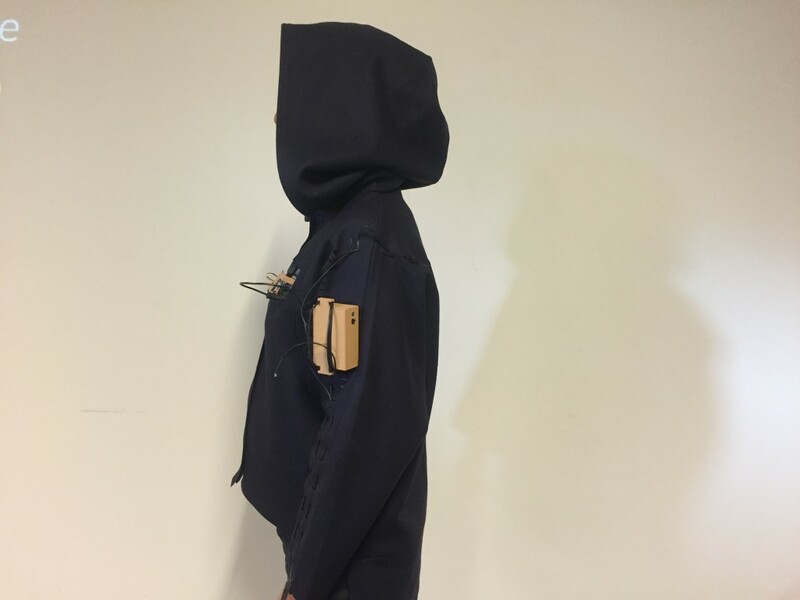 It is complemented by a more loosely fitting top layer with a big hood that combines strength and flexibility to carry the hardware casings (Figure 4). The design choices give users control to personalise the fit of the suit. These focus areas are explained in detail below. Ideally doing meditation experiments with Silence Suit should contribute to and enhance awareness and mindfulness. In designing the suit the designers wanted the putting on and taking off the wearable to become a rhythm of actions. In total there are eleven sensors on the suit and one feedback LED. They have to be fasted correctly and stored safely after use. The design was tested extensively by Roberts during her daily meditation practice and a six day retreat. During group experiments almost 40 different users tested the design. Feedback from users indicated that if all the sensors are fastened correctly the electronics have no negative influence on the meditation experience, people are not aware that they are being measured by 11 sensors. The way the sensors and fasteners are positioned facilitates the ritualization of the interaction with the garment. The attention needed to secure the sensors primes for attention during the session. Exclamations after the experiments like “Wow, this suit is so comfortable” were no exception. An oversized hood inspired on the cowl of a monks’ habit. It was used frequently by Roberts and the experiment participants. In a practical sense it shields from cold while sitting still. But it also creates intimacy which makes it easier to withdraw and block out distractions. Both Roberts and the participants have used the hood for these purposes. On the top layer there is a vertical row of seven incisions. A small flap can be inserted into these slits creating an opening in the garment. This provides an analogue and transparent way to track daily sessions. Thus the practice is made visible and tangible which can be motivating. These interactions may also create an extra bond with the garment, making it more personal. 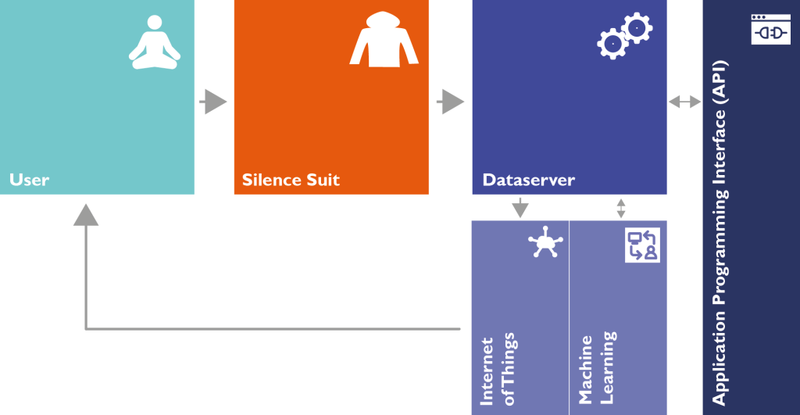 With the wearable comes a custom software application, the Dataserver (Figure 5). The functionality of the software is based on enabling users to experiment with their own meditation practice. The hypothesis underlying the functionality is that the environment in which one meditates has an impact on the quality of the meditation session. Changing the environment may impact the meditation quality in a positive way. The current version of the Dataserver supports experimenting with environmental light. Three light conditions are offered to experiment with. Research in other domains has shown that these conditions can respectively impact concentration, alertness or relaxation. With the system users can log, view and compare data, conduct single and group experiments using the three light settings. Meditation quality is determined by pre and post meditation questionnaires. The quality outcomes are used in a machine learning algorithm. Once the system is trained it will automatically change the environmental light based on predictions of meditation quality. In the form of graphs after a meditation session. In this sense the software is used as a quantified-self tool. Self-tracking has been shown not only to give trackers awareness of and insight into the workings of their body it also gives the sense of being able to transform their bodies. The meditation kit creates awareness of the body through biometric data. 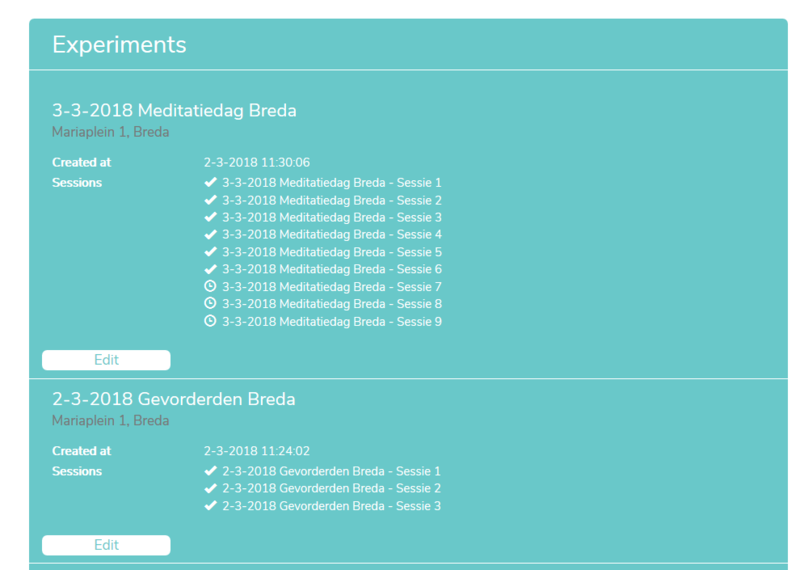 Filling in pre and post meditation questionnaires makes the user aware of subjective mind states connected to meditation thus empowering users to also experience more control of and insights into the workings of their minds. This can motivate users to practice. In the form of an embodied experience during meditation based on real-time data. In this case the software transforms the actual meditation experience by predicting the most optimal light conditions throughout the session. This may lead to improved relaxation, concentration and alertness during the sessions. In the above is explained how the design uses size, fit and style to enhance longevity through awareness and control. Care is one of the fundamental areas mentioned in the WRAP Design for Longevity report in promoting the lifespan of a garment. Easy replacement and repair was one of the guiding principles to support the durability of the design. This has been approached in different ways which are outlined below. Level 1: By clearly separating the electronic parts from the garment, instead of integrating them, the design approaches sustainability through transparency. This “white box” approach makes the electronic infrastructure visible and easily accessible. This creates awareness. Level 2: Instead of working towards miniaturisation and using unique custom parts, the design uses the ready made breakout boards and leaves them mostly intact. The entire board can be removed and replaced in one action. 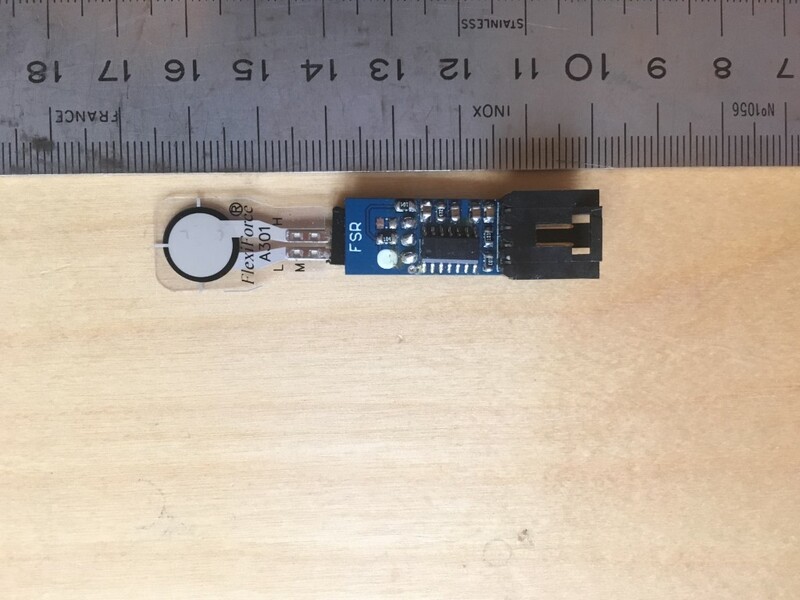 Most of the electronic parts and sensors are low cost, off-the-shelf Open Source components which can be bought from online electronics shop. 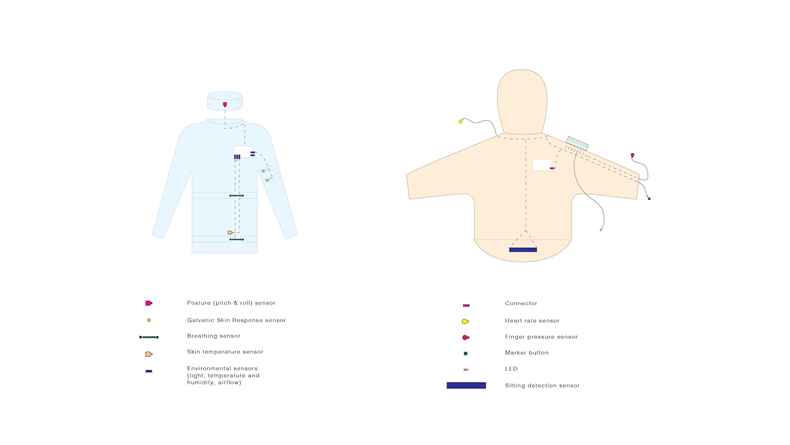 These two approaches on different levels aim to facilitate user control to increase the lifespan of the suit. Access and modification of the production files is a transparent approach which allows for custom modification during the lifecycle of the suit. Once the patterns become available users can control the outcome of the suit. They can make the suit locally to their own taste and even modify the files to make a personal, tailored version. These customizations can be done by the user herself. Embodied actions may strengthen the bond with the wearable making it more and more personal over time. The flexibility of the wearable is also reflected in the software approach. The system architecture is designed to be scalable: users, suits and actuators can be added to the system without breaking it. Software flexibility is also expressed by providing an API. This allows users to control the output and to build custom applications using their own data and extend the use of the platform. Material choices for the Silence Suit were made with recyclability and carbon neutrality in mind. The top layer is 100% wool, one of the most sustainable textiles. When exposed to moisture, the fibre will gradually decompose. The chosen material of the bottom layer is a mixed Modal fabric. Modal has been made from a renewable crop and is biodegradable.Laser cutting requires special properties of the textile. At this point in time no more sustainable fabric options were available therefor a mixed fabric was chosen which is not fully biodegradable. Up to date fabric recommendations will be accompanying the digital production files allowing users to choose the most sustainable options available. 3D printed casings and cable connectors were printed with a PLA filament. This carbon neutral filament is plant based and biodegradable. It can also be recycled with a plastic recycling machine which can even produce a new filament to start with. The modularity and transparency of the suit design facilitate responsible actions at the end of the life cycle, this may be considered a new luxury in the realm of wearable fashion. Textiles and electronics are often merged in order to obscure the technology and render it unobtrusive. However, in this design, users can manually separate the fabric from the electronics without any special tools or equipment and recycle the parts locally. The systems’ transparency and ease of disassembly removes barriers for users to dispose of the suit. The “intestines” of the suit are laid bare. This creates awareness of what the suit is and how it is put together. In the previous part it is explained how embodiment and transparency drive awareness and control in the present prototype. Future plans and applications are geared to further strengthen these qualities. Future research will focus on stimulating more senses to enhance embodiment. Apart from light influence research will extend to other senses and actuators, for example room temperature and airflow. Roberts is designing immersive meditation experiences from live meditation data. She is working on tele-meditation and meditation performances which will provide novel paths to user awareness. Multi-sense actuation and immersion will provide more ways to experience body awareness. The five suits available now are not ready for market. The plan is to sell the design as a physical kit, reminiscent of the various experimenters’ kits available from open source online vendors. Ideally users can purchase the kit in different stages of completion corresponding to the scenarios outlined above. Future developments will be aimed at making the digital blueprints accessible and transparent for specific user groups, so that users can enter the production of the Silence Suit at the level most suitable to them. 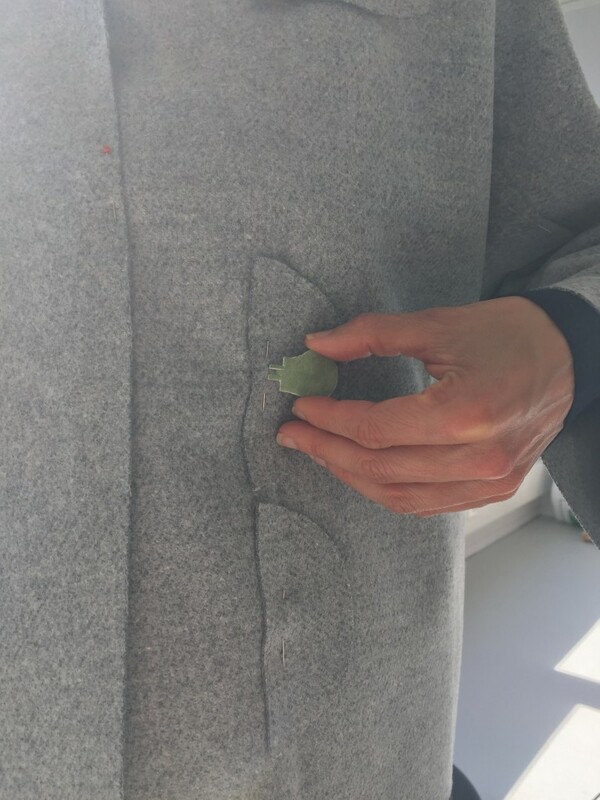 To improve assembly time and make production more efficient for all user types, further developments will also be aimed at implementing 3D printed connectors to eliminate any sewing activities. Parts can be upgraded, updated and reused and eventually more easily recycled when no longer needed. Open source schematics and code allow for user-driven upgrades and customisations. Once the API to the Dataserver is published programmers can start building their own applications on top of the system giving them ultimate control over its use and outcomes. 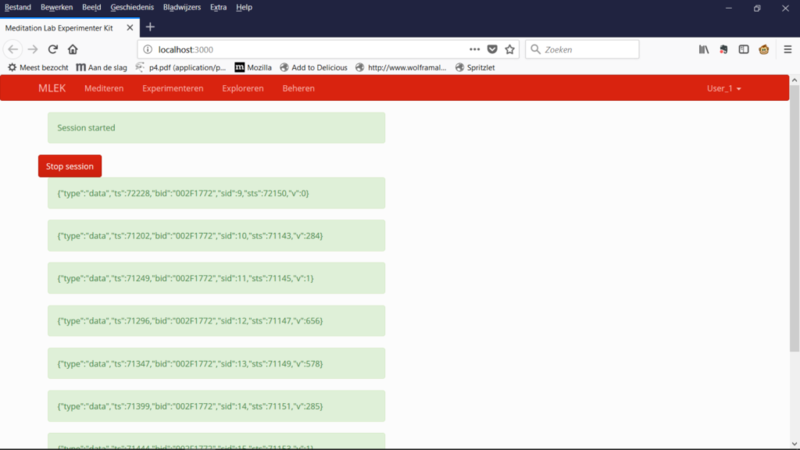 Experiment together: because of the research component embedded in the system users can connect by conducting experiments together. This feature is already provided. Community platform: the plan is to create an online community platform were users and makers can exchange experiences, knowledge, ideas and parts or redundant suits. This can help to move towards circularity. New ways of connection through technology: as explained above Roberts is working on novel ways of sharing meditation data and creating new, shareable content and experiences from it such as performances. App creation: makers will be encouraged to share their new applications and code with others. The findings with regard to user experience are mostly from one source, Roberts. At this point she has used the system most frequently. On the one hand this provides a profound knowledge about the interaction with the suit on the other hand these insights are limited to only one user who is also the maker and therefore has prior knowledge of and perhaps a positive bias towards the wearable. The wearable was to some extend made to measure for Roberts which might also give her an advantage when it comes to judging the fit of the garment. However participants of the experiments did not contradict Roberts’s findings. More intensive individual experiment tracks are planned which will yield more insight into user satisfaction during frequent use. New experiments also will give more insight into the effectiveness of the meditation actuation through light. Findings from one user are not enough to determine if environmental light has a positive effect on meditation quality. Meditation Lab Experimenter Kit has from the start been conceived as a springboard for applications which will make use of the kit. This becomes apparent in for example the provided API and the digital blueprints. So even though the future plans may seem speculative they have been part of the design from the start. What the effects of the proposed new applications will be is part of the design and research process that will inform these new designs. The authors wanted to extend the findings of current design to the future perspective they foresee for the system precisely because user control and adjustability is an essential part of the new kind of luxury this design provides. System transparency in the form of: System modularity and local production, self-assembly and customisation by the user and open source philosophy. Elements of embodiment in using the system in the form of: ritualization of interaction, emotional bonding, embodied and tangible interaction, personalisation. Emerging from interactions between these principles the system also allows for new kinds of connections, turning the individual act of meditation into something which can bring users together. This is true for the current prototype and will be build upon as the system ecology develops. Bergsland, R. (2017). The human/wearable technology engagement and its embodied effects on self-trackers. University of Gothenburg. Ryan, R. (2016). The Fashion English Bible. Vaughan, p 265-266. Seuntiens, P.J.H. & Vogels, I. (2008). Atmosphere creation: The relation between atmosphere and light characteristics. Proceedings from the 6th Conference on Design and Emotion 2008. Sharon, T. (2017). Self-Tracking for Health and the Quantified Self: Re-Articulating Autonomy, Solidarity, and Authenticity in an Age of Personalized Healthcare. Philosophy & Technology Volume 30, Issue 1, pp 93–121. Taillard, J., Capelli, A., Sagaspe, P., Anund A., Akerstedt T, Philip P (2012). In-Car Nocturnal Blue Light Exposure Improves Motorway Driving: A Randomized Controlled Trial. PLoS ONE 7(10): e46750. Zhou, Wei & Piramuthu, Selwyn. (2014). Security/privacy of wearable fitness tracking IoT devices. Iberian Conference on Information Systems and Technologies, CISTI. 1-5. 10.1109/CISTI.2014.6877073. The same counts for the software systems, which the user can control completely and also build upon. View also “Maintenance and repair supported by transparency and control”. For the past couple of weeks I have been working on the first version of my Soft Meditation piece. This is a performance in which I meditate and live data is transformed into an animated, artistic visualisation. For the past year I have been developing, together with a team, Meditation Lab Experimenter Kit. 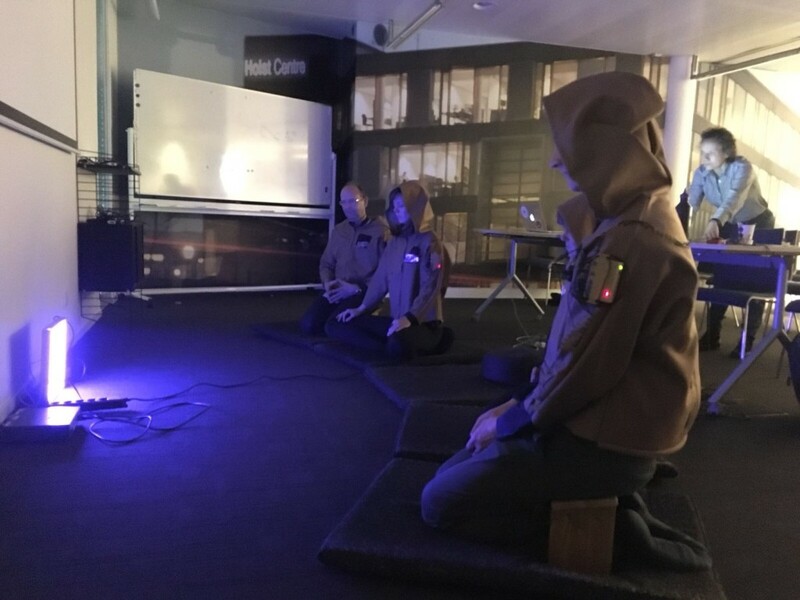 A tool-kit that consists of a suit with sensors and software which allows you to monitor and optimise you meditation practice through self-experimentation and interaction with the environment. 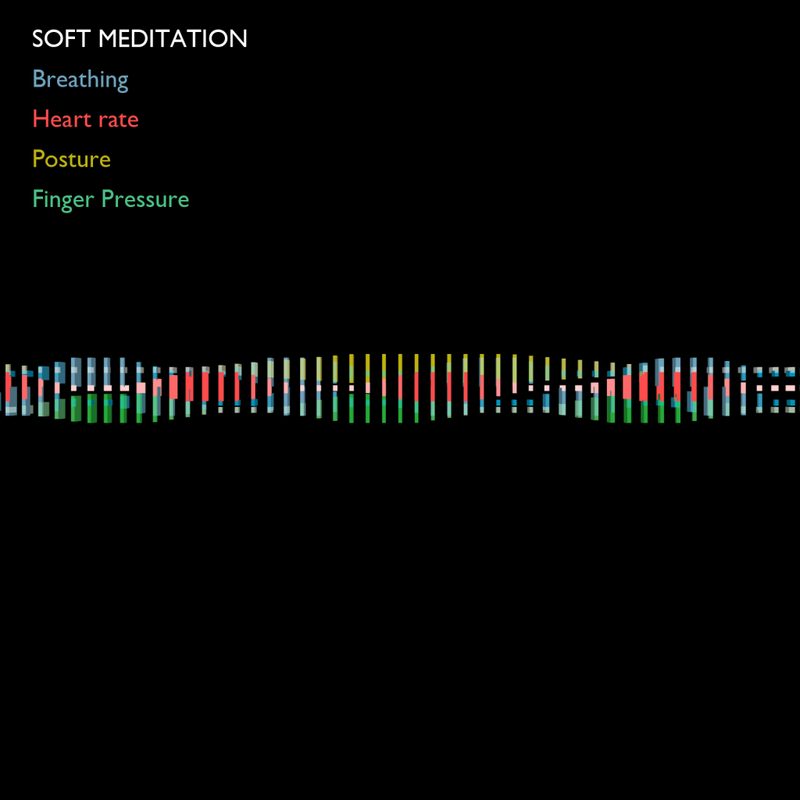 Soft Meditation is the first application made with this tool-kit. It uses the API to create generic imagery from live sensor data collected with the suit. My aim is to explore whether donating personal data can create a positive, meditative effect in others even though they aren’t meditating themselves. The title of the performance refers to the environmental psychology term soft fascination coined by Kaplan and Kaplan as part of their attention restoration theory. In my own words: the theory describes how looking at natural phenomena like waves on the water captures your attention without causing any cognitive strain. That way the mind can restore and refresh. Meditation is all about attention and I am looking for an easy way to capture the visitors attention and take them to a place of calm. Trying to do this with meditation is, despite of popular belief, quite hard work. So soft also refers to the gentle and playful way in which, I hope, a meditative state of mind is achieved. But how do I capture attention in a way that is calming and uplifting? I’ve read some articles (view references below) about the affective properties of motion graphics and compiled an inventory of effects. For my goal it would be best to use slow, linear motion from left to right. I could then play with speed and waviness to create more intensity and interest depending on the sensor data in direct input. For years I’ve been thinking about expressing my inner meditation state through a water metaphor. Movement of water is endlessly fascinating and mysterious and to my mind perfectly suited for my intentions. I looked for inspiration online which set the boundaries for which software environment to choose. 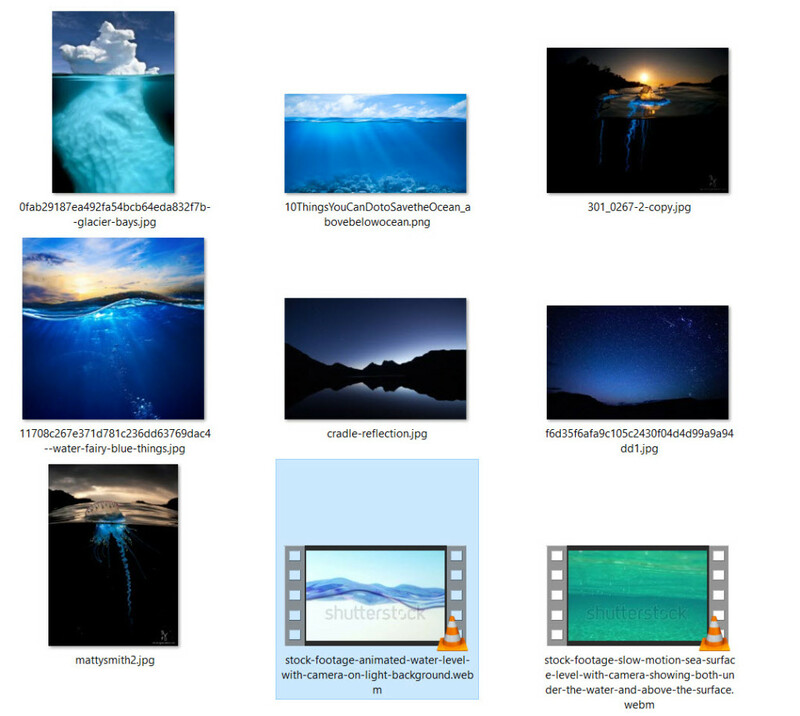 After exploring various platforms, languages and libraries I ended up with good old Processing as a platform. I found this sketch online which offered a nice starting point to build on. I started modifying it. Considering I wanted a complex and lively wave animation I choose pitch (nodding movement of the head), breathing (top and bottom), finger pressure and heart-rate as input sensors. 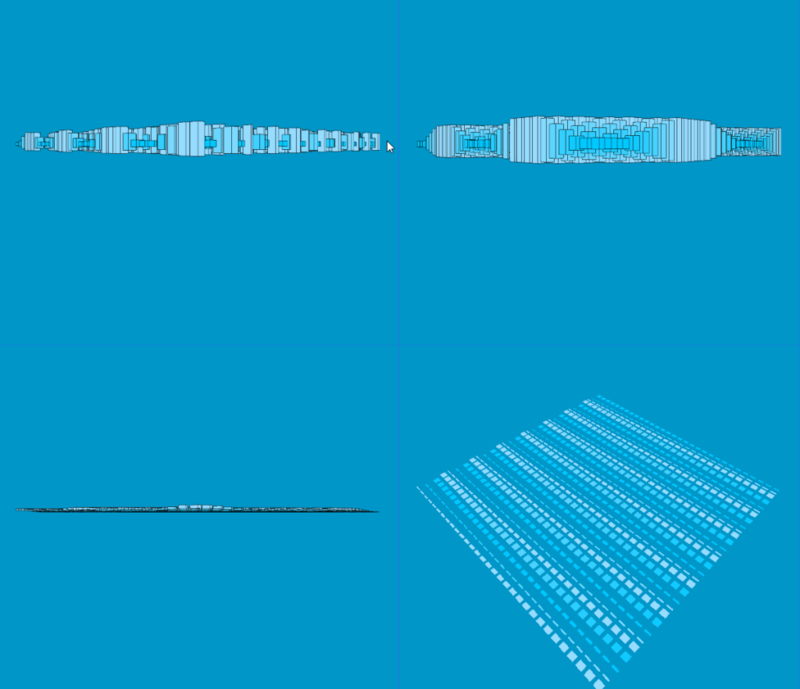 I have been thinking about how to make the performance multi-directional. I wanted to somehow include the audience into what is happening on the screen. What both me and the audience share are the sounds in the room. I decided to use the marker button provide with the suit to change the animation speed depending on the loudness of the sounds. Over time the audience would notice the relation between speed and sounds was my idea. I was invited to give a short presentation at the Human-Technology Relations: Postphenomenology and Philosophy of Technology conference at the University of Twente. Instead of a talk I decided I would test my prototype. I could only last for 5 minutes. I had programmed the sound of a bell at the beginning and end. I was facing the wall while the audience looked at a big screen over my head. I was a bit nervous on how it would be to meditate in front of some 30 strangers. But once I sat down it was just like I always do: notice my body (pounding heart) and mind. I was less pleased with the demo effect. One sensor was not working properly (I still don’t know why). This created hard-edged shapes and motions from right to left the exact opposite of the intended animation. I tried pressing the marker button when I heard something. But as the performance progressed the room became more and more silent. Which I suppose is a sign that it worked but not something I had counted on. I am of course interested in the effects of the performance. I supplied the audience with the Brief Mood Introspection Scale (BMIS). Four sub-scores can be computed from the BMIS: Pleasant Unpleasant, Arousal-Calm, Positive-Tired and Negative-Relaxed Mood. I asked to fill them in before (baseline) and after the performance. 10 questionnaires were returned of which 6 were complete and correct. I am working on the results and will report on them in a later post. I was pleased to hear that people were fascinated by the wave and tried to work out what it signified. People found the performance interesting and aesthetically pleasing. We discussed what caused the effects: the context, the staging of me sitting there and people wanting to comply, the animation or the silence? A lot of things to explore further! One participant came up to me later and explained how much impact the performance had on him. He found it very calming. “Everything just dropped from me” he explained. It also made him think about silence in his life and looking inward more. This is all I can hope to achieve. I continue my research with new energy and inspiration. The next version of the performance will be on show during the biggest knowledge festival of south Netherlands (het grootste kennisfestival van zuidnederland) in Breda on September 13th. – Feng, Chao & Bartram, Lyn & Gromala, Diane. (2016). Beyond Data: Abstract Motionscapes as Affective Visualization. Leonardo. 50. 10.1162/LEON_a_01229. – K Piff, Paul & Dietze, Pia & Feinberg, Matthew & Stancato, Daniel & Keltner, Dacher. (2015). Awe, the Small Self, and Prosocial Behavior. Journal of personality and social psychology. 108. 883-899. 10.1037/pspi0000018. Last week was very exciting. I put my system to the test during group experiments. I did 10 sessions in total at three different locations and gathered data from 23 different participants. People could register for beginner or advanced sessions with consisted of 20 or 60 minutes of meditation respectively. New for me was working with Eventbrite. Through this system participants could register and select the appropriate suit size (only 5 suits were available in 3 sizes). I am very pleased at how this went. People could interact with me through the platform and it was easy to change orders. Some participants couldn’t make it but all graciously let me know in time. Simon from Protospace had worked very hard to get the system ready for conducting the group experiments. I can now register users. The system creates a unique random ID allowing users to take part anonymously. Suits can be added and named. Every time I want to experiment I create meditation session (duration, actuation). To this session I add users, assign suits to users. Create experiment (name, comment), add sessions to experiment and see completed and incomplete experiments. The starting and stopping of a session goes through the server with a nice bell sounding at the beginning and end. This also automatically starts and stops the logging of data. Each user can fill in their own form through a dedicated URL which is available as long as a session is active. Eventually we want all users to be able to use their own device to fill out the forms but at the moment the style sheet isn’t compatible with every device. I was very happy to see that users love the look of the suits, many selfies were taken. It wasn’t a surprise that people found the suit comfortable to wear. 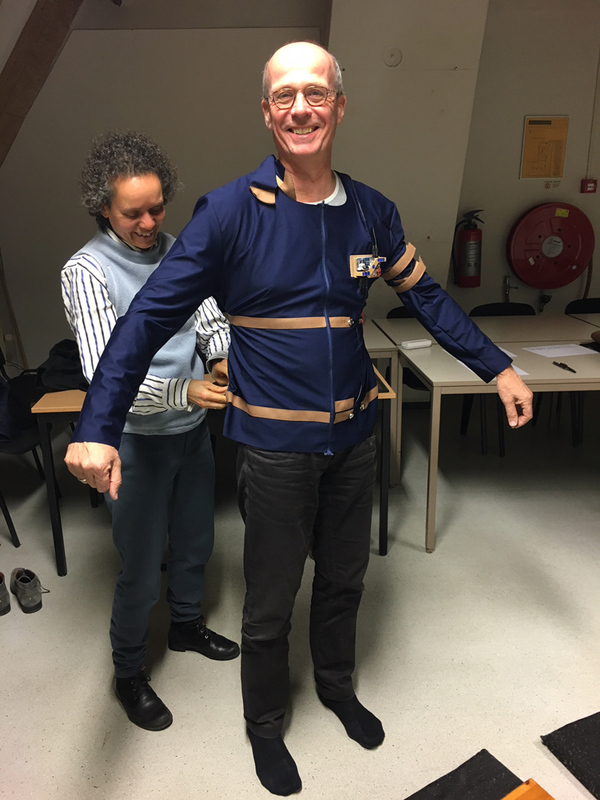 Vera de Pont and I spend many hours optimising the fit of and interaction with the suit. The hood was used quite often for a feeling of privacy and safety. The hood also provides warmth which is nice when sitting still. People felt that the hood made it easier to turn inwards. Some people did have a problem with the collar. It is made of soft, flexible fabric and designed to fit snugly around the neck. The close fit will ensure that even the tiniest movements are captured. But even when the collar is fastened less tightly the data is comparable to the tight fit. The sessions could be conducted as normal meditation sessions. As an observer it struck me how peaceful they were. There wasn’t more movement or restlessness then in any other meditation session. The technology did not seem to interfere with the meditation. Filling in the questionnaires was a bit of a hassle due to issues explained above. I have worked mostly with 2 laptops which could be used by the participants during walking meditation. But the filling out does take a lot of time, especially when the questions are new to people. Also some of the questions sometimes puzzled participants. Some questions are based on Buddhist theory, not all users are familiar with that. The experiment design was that each 20 minute session would test one type of light. Although I explained this clearly on the ticket registration page people had different expectations. Some people expected a more dynamic light. These are interesting things to explore in the future but at this point the most important thing is to find a relation between the light and the meditation quality. 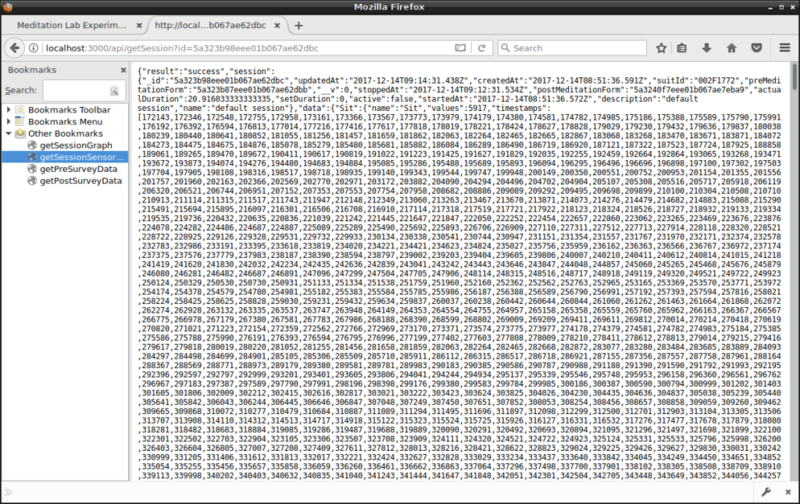 The more I vary, the harder this will be, especially as my dataset still isn’t that big. The blue light in particular was experienced very differently by people, while some found it relaxing others got a headache… One participant suggested to use indirect light. A very good idea. That way you are not watching a light source but are just experiencing the radiance. I have been testing it and have found it much more comfortable. Participants are much interested in the biometric data. At this point there is only limited possibility to view the data. It would take too much time to show every user. All participants will get plots and a summary of their data of the sessions they participated in. The people that did look at their data found it mostly confirmed their feeling about the experience. They could for example recognize their fidgeting during a session and the deepening of the breathing between sessions. 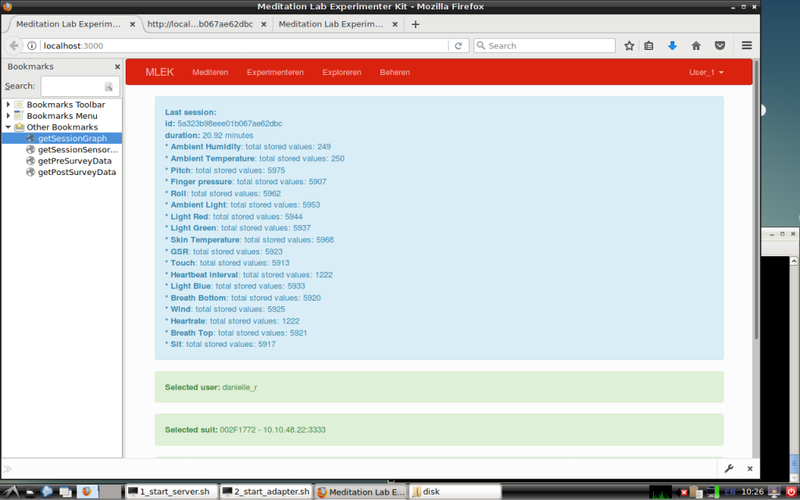 We are working towards an overview of all sensor data on one page, providing mean values and comparison of sessions. Making the experience of the data more meaningful and helpful is something I will be exploring in the near future. It is a study in and of itself. The experiments were about testing the suits and the system. Working with so many people has been really worthwhile. I have much better insight into what works and things in the system and experimentation routine that can be improved. The data of different users will be fed to the smart algorithm to help improve it so it can create the most optimal light during meditation. If you ever want to participate, keep an eye on my Eventbrite and Facebook page. Or contact me through this blog so I can put you on the list. Hope to meet you sometime! This article I wrote with my intern Meike Kurella for the Design Research Society conference 2018. The article was rejected but we would still like to share our findings here. In this article we explore the role of an artist in a multidisciplinary team with regard to the effectiveness of the communication and the productivity of the team. In this case study a diverse team worked towards a complex, multifaceted, interactive art piece. Our main questions were: What makes this challenging collaboration successful? How does the team deal with the boundaries they encounter? We have looked at those questions from the following angles: The teams’ use of boundary objects, the multidisciplinarity of the artist, her artistic vision and the final result the team is working towards. We have researched these questions using observation, reflection and through a questionnaire answered by every team member. We have come to the conclusion that all four angles have contributed to the success but there may be other factors at play which call for further exploration. Artist DR works at the intersection of art, technology, science, spirituality and design. With her work she wants to promote self and environmental awareness and well-being using emerging technologies and data. At the time of the call announcement she had already been working on a wearable for a year. The wearable tracks physiological and environmental data during meditation. Its aim was to learn if and how meditation practice can be optimised by changing aspects of the environment. This wearable fitted the theme and criteria of the call. She applied for the call and was one of the 23 winners. Below follows a brief description of the project. To realise this the system makes use of emerging technologies like Internet of Things. This allows devices to talk to each other wirelessly such as, in this case, the wearable and the light device. An artificial intelligence module will learn from the data to create the most optimal light circumstances for meditation for individual users. 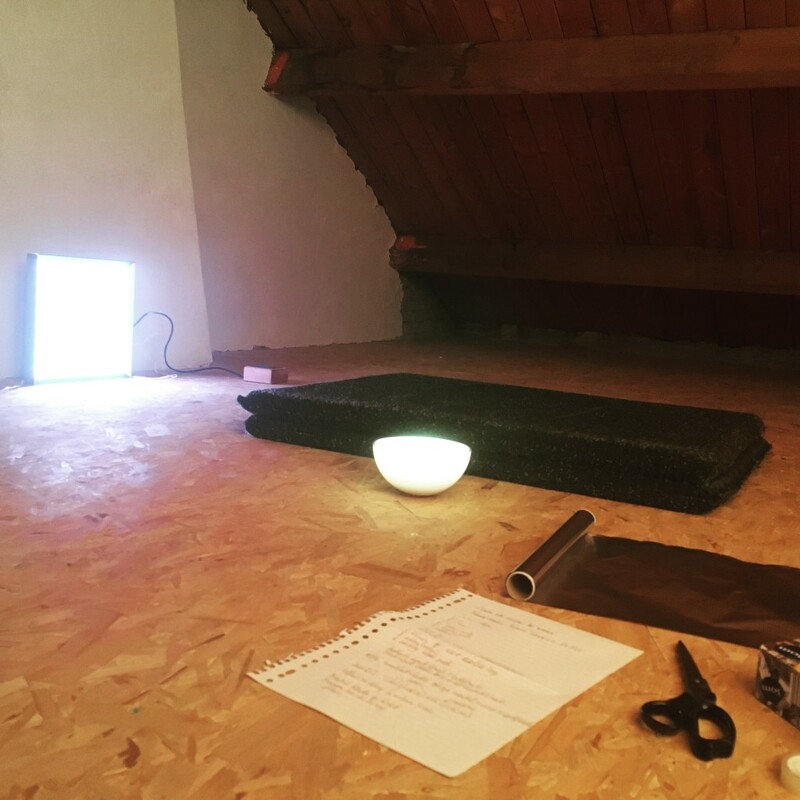 During this 6 month project we focussed on building a basic, flexible system that can actually influence meditation through light. The structure of the call is such that you apply with a team, they are the project owners and get to spend the most time and money on the project. With additional vouchers a team can buy external expertise not present with the team members. So there is a technical difference between team members and external experts. For our research in this article we will however regard both types of collaborators as part of the team. Both authors of the article are part of the team. They work on the project as well as reflect on the collaboration. Below we will describe the team and its members in more detail. What might set this project apart from other design assignments is that the artist is also the commissioner. She had complete freedom in determining the deliverables and setting their standards. She could decide on the success of the project and its outcomes. At the time of writing the project is still ongoing and is in its third month. But the first stage of the project is where the collaboration is most intensive and the meetings are most frequent. 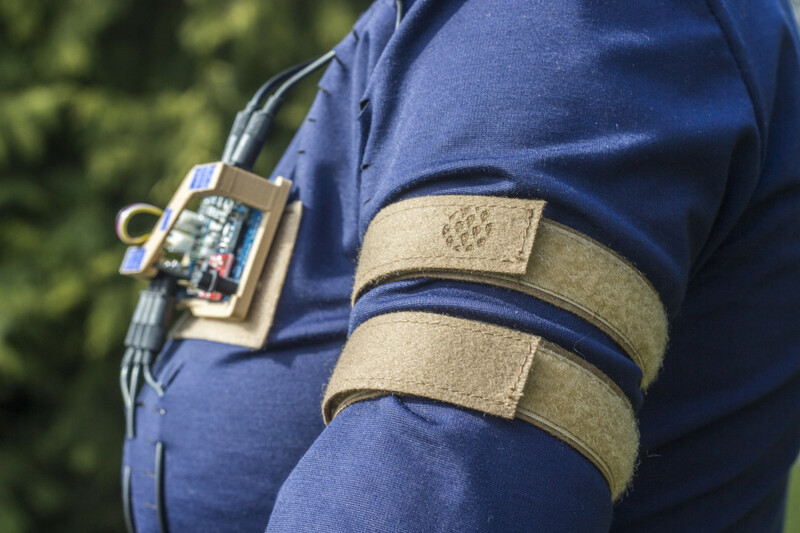 During the first stage the design and production of the wearable takes place. The data server structure and interface is designed. Both these activities require a lot of communication and collaboration. We therefore think that reflecting on the collaboration at this stage will still yield valuable insights. More so because were are not only looking at the results to inform the success of the project and collaboration but we are especially looking at the role of the artist within the team. The team consists of a mix of experienced experts, students and interns. Their backgrounds vary from computer science and electronic engineering to design and fine arts. This is a typical setting of boundaries at work in the technology and design domain as explained by Akkerman (Akkerman & Bakker, 2011). Below is a summary of the team members’ roles and expertise. This provides a picture of the diversity of the team. DR is an artist. She is the project manager and during this part of the project works on various design tasks ranging from interaction design, experiment design and soft electronics. She holds a BFA in sculpting and monumental design. She has completed several university courses in psychology, psychological experiment design and statistics. She finished several courses in the field of software engineering and intensively studied information architecture. She learned the basics of electronic engineering. She took online courses on Buddhism and psychology and philosophy. And she has studied and practiced user-centred design. DR combined autonomous art production with work as a self-employed web designer (until 2013) and various teaching jobs and project management in the cultural sector (up to the present). We will explain the significance of this knowledge and experience in the collaboration process below. VP is a textile designer with a strong interest in technologies like 3D printing, laser cutting and sustainability through fashion on demand. She is responsible for the suit design, pattern making and production. SB is an embedded software engineer with experience in hardware for wearables and software development. He’s an employee of the innovation acceleration foundation Protospace. He is responsible for the system design and programming of the Data Server. SG is a master student embedded systems. At this stage he is responsible for the electronics and firmware. KH is a master student embedded systems at Twente University. He is responsible for the design and production of the PCBs. JD is a bachelor student mechanical engineering at Twente University. 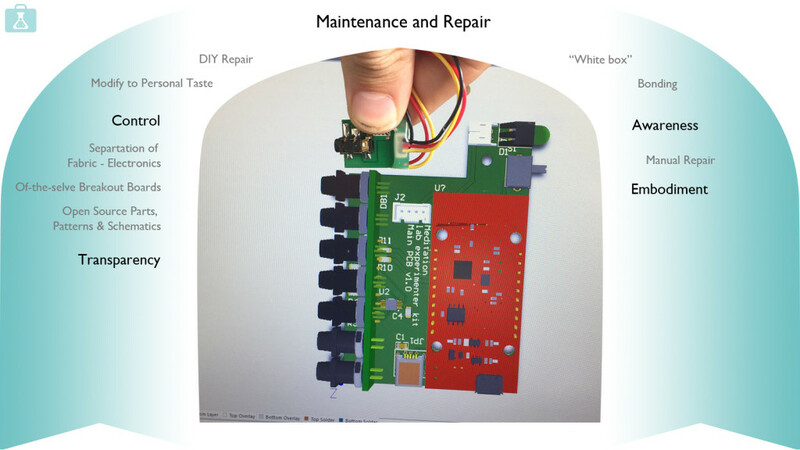 He is responsible for the design and 3D printing of the containers for the electronics. AH is a student Multimedia Design and Communication and is an intern at Protospace. She works on the user interaction and interface design of the Data Server. GB is a data scientist. He is responsible for the learning algorithms and artificial intelligence module. HA is a software architect. His responsibility is to ensure the robustness, flexibility and scalability of the whole system. MK is a fine arts student. As an intern at DR she works on describing the ongoing development of Meditation Lab Experimenter Kit in a weekly blogpost and various hands on tasks like sewing. The team has used several ways to communicate. Because members were scattered over 5 locations telephone and teleconferencing have been used in addition to face to face meetings. To research DRs multidisciplinairity and the impact on the collaboration with experts from different disciplines, we reflected on the interaction between team members in specific meetings. Especially, we focused on the role of the DR in relation to others. In this research DR reflected mainly on herself and how she experienced the collaboration and the communication. MK took on the role of an observer to reflect on how the collaboration and the communication seemed to a third party. To verify the assumptions we made, we asked all team members to fill in a survey about how they see the collaboration and communication. In this survey we combined 5 point Likert scale responses with open questions where the team members could describe their individual point of view. So we could get as much detailed information as possible as well as the possibility to compare them to each other. The questions we asked the team members were about their own role and their motivation to work on the project. DRs role and her qualities, as well as the interaction between DRs role and the team members and the quality of the communication within the collaboration (Attachment 1). In this part we want to further explore the role boundaries play in this project. We have described the multidisciplinary team, the artist leading the team and the mixed media deliverables the project will yield. We want to take this a step further and show how boundaries, boundary crossing and boundary objects are at the core of the process and the end result. In order to make communication and transfer of knowledge possible and better, mixed teams make extensive use of self-created objects often referred to a boundary objects. They can be described as artefacts doing the crossing across sites by fulfilling a bridging function (Akkerman & Bakker, 2011). The team described in this article is no exception. We have identified 19 objects which can be considered boundary objects (table 1). They have been used on varying occasions and by different numbers of team members. Because the art piece is multi-faceted, every facet has its own set of objects which may explain the even distribution of use and perceived usefulness of the various objects (table 1). Other objects have been used but were mentioned once or not at all by team members in the survey. From the reactions in the survey it has become clear that the appreciation of the communication and the intensiveness of use of boundary objects are strongly linked. To explain this finding we give two examples on the extreme of the collaboration spectrum. On the one hand is the work with VP, the suit designer. VP rated the overall communication 5/5. DR and VP have worked intensively on the user interaction with the suit. They have used iterations of the suit prototype to explore the way in which users will wear it and interact with it. The prototype was always at the centre of the communication. They enacted the future interaction with the suit with simple objects available at the scene (image 1). This way they simulated the future reality for the user and made it visual and tangible for both the artist and the designer. This type of learning through boundary objects is part of the reflective impact of boundaries called perspective taking. “This taking of the other into account, in light of a reflexive knowledge of one’s own perspective, is the perspective-taking process”. (Akkerman & Bakker, 2011, pp. 145). We crossed the boundary into the future to imagine the most optimal way for the future users to interact with the garment. The object facilitated our learning and thinking process. On the other hand is JD, the 3D printing expert. JD rated the overall communication 2/5. Contrary to the many samples of VP, JD only presented DR with a 3D drawing of one of the containers during a Skype meeting. It was difficult to get a clear idea of the container from the screen, this was also hampered by lack of computing power to render the drawing. In his statement he clarifies that much remained unclear because of different frames of mind. This makes clear that from his perspective boundaries were not crossed. This is underscored by his remarks when questioned about the use of boundary objects: he finds boundary objects useful in general but acknowledges the fact that we made poor use of them and mostly used email. What was lacking is this particular communication was the learning aspect of coordination in which “…effective means and procedures are sought allowing diverse practices to cooperate efficiently in distributed work, even in the absence of consensus…” (Akkerman & Bakker, 2011, pp. 143). In those cases boundary objects facilitate the bare minimum of dialogue necessary to maintain work flow (Akkerman & Bakker, 2011). 3D printing is an area DR is not very knowledgeable in. JD is a young and specialised student. The two perspectives were very much apart. A requisite for coordination is a communicative connection between diverse practices or perspectives established through boundary objects (Akkerman & Bakker, 2011). The lack of (good) mediating artefacts at least partly explains the low productivity and stagnant work flow in the design and production of the containers. These examples make very clear the key role boundary objects have in supporting boundary crossing communication. To characterize DR as an artist we first need to define different kinds of artists in the contemporary art scene as described by Gielen, van Winkel, Zwaan, 2012. Nearly every contemporary artist is a multidisciplinary artist who has no steady medium. By medium we mean the traditionally known disciplines, such as painting, sculpting or ceramics through which the artist expresses himself. We are living and working in the post-medium-conditions. This means that the question about the medium no longer defines the artistic practice. It no longer defines you as an artist. It changes the artist’s self-concept as well as how he is seen in the society (Gielen, van Winkel, Zwaan, 2012). In our days, many creative professions are plural practices. Bureau and Shapiro define in ‘L’Artiste Pluriel’ three different levels of pluriformity: the polyvalent artist, the polyactive artist and the pluriactive artist. The polyvanlent artist has different tasks in his own artistic practice. That could be creating things, developing the concept as well as managing his own project and governing financial matters. The polyactive artist has different professions in different social fields. It is the artist who has a non-artistic job in addition to his artistic practice. The pluriactive artist has different professions in the creative field. That means that the job you have in addition to your artistic practice takes place in the applied art field. Pluriformity is an economic as well as a legislative and a political choice. It offers you a financial security but it changes the identity and the autonomy of the artist (Gielen, van Winkel, Zwaan, 2012). Camiel van Winkel, Pascal Gielen and Koos Zwaan add a fourth level of pluriformity to the artistic practice. It is the hybrid artist they introduce. A hybrid artist firstly has to be a pluriactive artist. Secondly, the two practices of autonomous and applied art are no longer divided, so that they are equal. They take shape in one context and in the same production. The blurring can contribute to the identity and the profile of the artist in a positive way. The artist has no need to divide the tasks because they enhance each other (Gielen, van Winkel, Zwaan, 2012). As van Winkel, Gielen and Zwaan describe, together with the hybridism and the post-medium-conditions goes also the deskilling of the artist. The contemporary art practice is build up around a framework of concepts, intentions and attitudes. The vision of the artist is central. From here the artist determines which (technical) skills he has to learn to realize the vision. This phenomenon is called deskilling because the skills itself come on the second place. They are a derivative of the vision instead of a main thing. The artist creates a versatile package of skills (Gielen, van Winkel, Zwaan, 2012). In this sense the artist maintains his autonomous context which is characterized as self-determined, uncompromising and authentic (Gielen, van Winkel, Zwaan, 2012). The vision of the artist is central. It is the critical view of an artist and the extraordinary capability to reflect on yourself as well as on the society. A driving force to the artist is the will to make things nobody is waiting for, except yourself. From the personal desires and inspirations around yourself the vision of an artist develops. Having described the various types of contemporary artist we will now explain how DRs position is unique and how it may influence the team collaboration. Looking at her art practice we can conclude that DR is polyvalent, pluriactive and hybride in different parts of her practice. When DR is working in her studio she is an polyvalent artist. Also in this project she has different tasks such as team leader, project manager and artist at the same time. She is a pluriactive artist when she adds various design aspects to her artistic work, may it be the research method or the outcome of the work. The combination of design and autonomous work goes further in the case of DR than a pluriactive practice. It definitely can be said that she is a hybrid artist. ‘There is no need to divide the different domains of my work, because it is not possible to divide them. The autonomous practice needs the applied art to meet my vision and vice versa’, she explains. We think that her skills and her artistic identity go beyond the practice of a hybrid artist. DR graduated from St Joost art school in Breda, the Netherlands in 1993 on the subject of sculpture and monumental design. So when she finished her art school education the post-medium-conditions were not that present as they are nowadays. DR is not only active as a creative but has also worked in and or studied psychology, ICT and spirituality. During her career as an artist DR has built a broad set of skills and she has expanded her knowledge continuously. Not only to keep up to date with new developments but also to broaden her view. This process is called ‘deskilling’ (Gielen, van Winkel, Zwaan, 2012). The choices of what to learn and how to expand are closely linked to the artistic vision. DR studied these fields to enhance her art practice and to be better able to talk to experts in different fields. On the other hand the studies and work in different fields are also a big source of inspiration to her. They feed her artistic practice and help her come up with new ideas and provide different angles of looking at reality. During her career she has stepped outside of the art scene and traditional artist sources. She has been on the lookout for new and interesting developments in science and technology. This is what sets her apart from regular hybrid artists. Having a broad repertoire and keeping a learning mind-set are typical for innovators (Liedtka, 2017). We believe it is this outlook which enables her to perform well across boundaries as we will explain next. Akkerman & Bakker explain the ambivalence people working at the boundary may perceive: On one hand they have a very rich and valuable position since they are the ones who can introduce elements of one practice into the other (cf. Wenger, 1998). On the other hand they face a difficult position because they are easily seen as being at the periphery, with the risk of never fully belonging to or being acknowledged as a participant in any one practice (2011). Within this project DR clearly performs the role of boundary crosser. Contrary to the claims made above she didn’t experience any of the difficulties described. We contribute that to the following factors. After winning the open call DR automatically became the commissioner of the Meditation Lab Experimenter Kit project. She also controlled the budget. She was right at the centre of the project and never experienced herself as being at the periphery. She felt a strong sense of belonging. DR describes her own role as including but not limited to guarding the process and keeping direction. With that comes a natural leadership position which the team recognises and respects. SG describes her role as between costumer and product owner. He says: “We have room for our ideas but finally, she [DR] has to agree. Therefore we have to underpin our ideas well.” Apparently the team members follow DR as a leader but also feel free to bring in their own ideas. 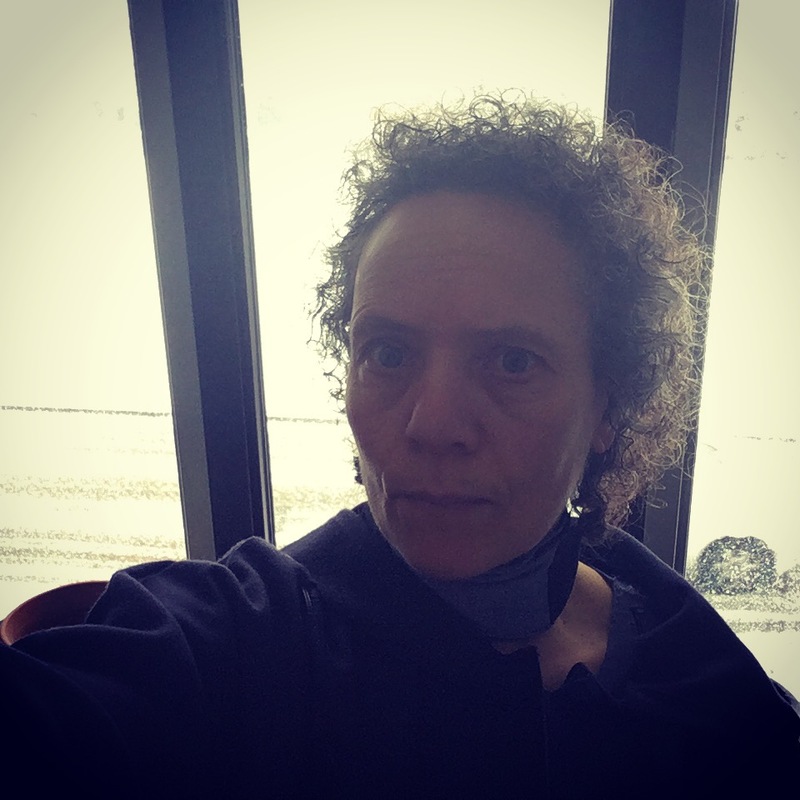 As for never being acknowledged as a participant in any one practice: this and other projects have shown that being a boundary crosser is at the core of her work and her identity as an artist. Complex projects like the one described in this case study enable her to fully be an artist at the cross-roads of disciplines and domains. We hypothesised that the artistic vision of DR could influence the motivation of the team members in a positive way. To verify this hypothesis we asked them in the survey if the artistic vision influenced their motivation. This yielded an average of 3/5. But there is only one team member who scored a 3. This points to a balance between two extremes of members who find the artistic vision a very strong influence on their motivation on the one hand, and on the other hand people who find the artistic vision does not influence their motivation at all. We wondered how it can be that the opinions of different team members on the same project are so far apart. On the other hand there are team members who mainly work on the project because of specific interests such as money or the fascination for their own discipline (e.g. JD: “Money.” or KH: “I am always in for electronics.”). We compared the extremes of the motivation to the extremes of the influence of the artistic vision and it appears that those who worked on the project because of the collaborative aspect were influenced by the artistic vision and those who were focused on a specific interest were not influenced by the artistic vision. We consider these two perspectives a strength of this project, not a weakness. Members coming from different angles could and did find their role and contribution to the project useful, as we will explain below. We see the artistic vision as guiding: even if it is not influencing people’s work or motivation directly, this project with all his complexity and diversity could never have taken place without a strong artistic vision. When looking at the description of a boundary object one may conclude that the final result of the collaboration will actually be a boundary object. The results translates between different disciplines as well as between autonomous and applied art. We believe this quality contributes to the success of the collaboration, as we will explain below. Users wanting to optimise their meditation. Users who want to experiment with their meditation. Developers who want to explore new possibilities with the data and the build in Internet of Things functionality. Users who enjoy the autonomous quality of suit and art works created from the data. Right in the middle of these use cases is Meditation Lab Experimenter Kit. To accommodate for these different uses the outlook and expertise of very different people was needed. With respect to item 1. we conclude that we have used many different types of boundary objects which can be explained by the multi facet-ness of the project. In most interactions they have been used intensively. Which resulted in good productivity and communication. In the one case where boundary objects were lacking we saw a lack of productivity and poor communication. With regard to DR as multidisciplinary we conclude that as an artist DR goes beyond the hybrid artist. Her innovative mindset has provided her with broad general knowledge. This enables her to easily cross boundaries. Her knowledge is sufficient to lead different team members. Being a generalist creates the need for expertise but also creates room for others to excel in their expertise. We can conclude that the importance of the artistic vision differs among team members. This is driven by individual motivation. Still the overall vision is crucial because it connects the many facets and disciplines included in the project. But we believe that the passion of the artist in pursuing this vision reflects on the team members and acts as a source of inspiration. It might be the (hidden) driving force to go that extra mile. It triggers the team members to cross the boundaries of their own expertise. Because we can identify the final art piece itself as a boundary object it provides room for users and experts to take a stance on the result and the tasks involved. This allows team members to view their contribution as an important part of the whole. The nature of the art piece is one of the aspects that enabled the successful design and production process. This research has provided insights into what aspects contribute to successful communication and collaboration. For this article we only looked at the first months of the project period. Future research should take into account the whole project period. We believe that the role of the artistic vision and artist as someone who inspires is worthy of further research. Abrahamson, D. & Chase, K. (2015). Interfacing Practices: Domain Theory Emerges via Collaborative Reflection. Reflective Practice: International and Multidisciplinary Perspectives, 16(3): 372–389. DOI: 10.1080/14623943.2015.1052384. Akkerman, S.F., Bakker, A. (2011). Boundary Crossing and Boundary Objects. Review of Educational Research, 81(2), 132 – 169. Bowen, S., Durrant, A., Nissen, B., Bowers, J. & Wright, P. (2016). The Value of Designers’ Creative Practice within Complex Collaborations. Design Studies, 46, 174-198. DOI: 10.1016/j.destud.2016.06.001. Gielen, P., van Winkel, C., Zwaan,K. (2012). De hybride kunstenaar; De organisatie van de artistieke praktijk in het postindustriële tijdperk [The hybrid artist; The organisation of the artistic practice in the post-industrial age]. Breda, Netherlands: AKV|St. Joost Expertisecentrum Kunst en Vormgeving. Liedtka, J.M. (2017). Design Thinking for Innovation, Coursera Course University of Virginia. 1. What did you expect from the project before you started? 2. What motivated you to take part in the project? 3. Meditation Lab Experimenter Kit is guided by an artistic vision (working towards a high tech hermitage). Does this vision have an impact on your motivation? 4. How do you see your role in and its meaning for the Meditation Lab Experimenter Kit prototype? 5. How would you characterize the role of Danielle within the project? 6. How multidisciplinary does Danielle appear to you? How does that impact your tasks for this project? 7. Do you fell Danielle’s knowledge is sufficient for your contribution? 8. The next questions are related to specific meetings. In answering the next questions please go back to one of the following meeting. State in your answer which meeting you picked. 2. To communicate we used several aids (think of: prototypes, schematics, shared documents.) How would you describe the meaning of those aids with regards to the communication? Which aids were most useful to you? 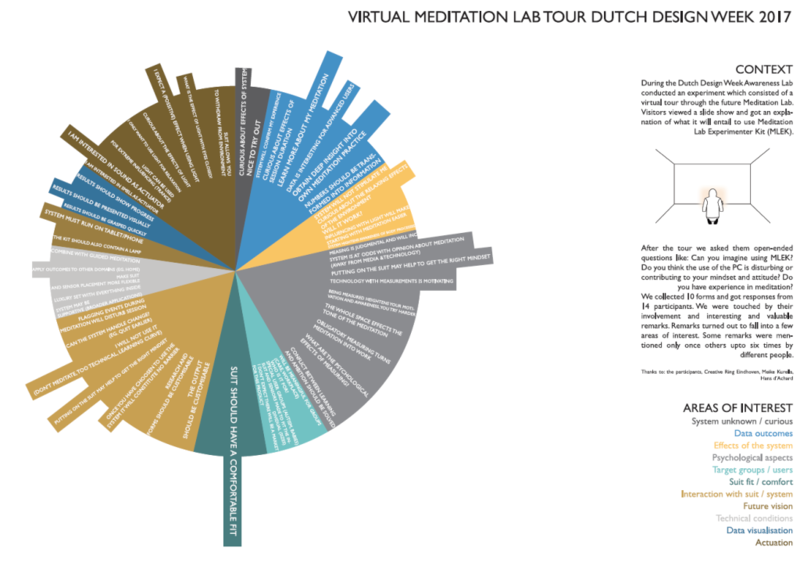 During the Dutch Design Week Awareness Lab conducted an experiment which consisted of a virtual tour through the future Meditation Lab. Visitors viewed a slide show and got an explanation of what it will entail to use Meditation Lab Experimenter Kit (MLEK). After the tour we asked them open-ended questions like: Can you imagine using MLEK? Do you think the use of the PC is disturbing or contributing to your mindset and attitude? Do you have experience in meditation? We collected 10 forms and got responses from 14 participants. We were touched by their involvement and interesting and valuable remarks. Remarks turned out to fall into a few areas of interest. Some remarks were mentioned only once others up to six times by different people. I would like to thank: the participants, Creative Ring Eindhoven, Meike Kurella, Hans d’Achard. A romantic dinner by candle light, bright lights in an office building. Both give us a very different experience. We all know from experience how light can influence our mood and the way we perceive a space. What I want to find out with Meditation Lab is if light conditions can also influence the quality of your meditation experience. I have a hunch that it does. This is also based on over 20 years of daily meditation practice. 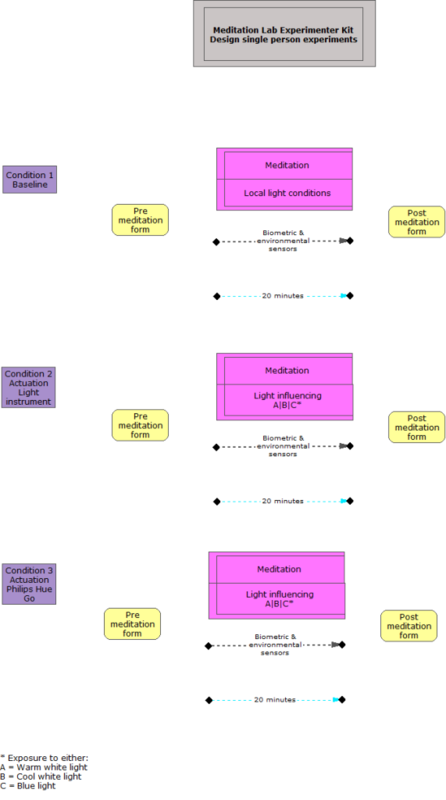 And I’ve found starting points on optimal lighting during meditation in scientific research. Contrary to a commonly held belief meditation isn’t about being relaxed and a little sleepy. I practice in the Buddhist tradition of Vipassana (insight) meditation. This form of meditation is about being fully present in the moment without effort. This clear observation will give a person insight into the true nature of reality. This insight will help to overcome suffering and to become a wiser and more compassionate being. An important concept in this context is the Satipatthana. So the ideal state for a good meditation session is being relaxed but at the same time alert. I had heard about changing light conditions in classrooms to support different activities and states of mind of students. I was also wondering if work had been done on the psychological aspects of light. I’ll summarize my findings and tell about how I will be translating that into one person experiments. Before diving into the theory I would like to explain how I will go about changing the light conditions. I was very fortunate be introduced to Tom Bergman. He is Principal Scientist at Philips Lighting. 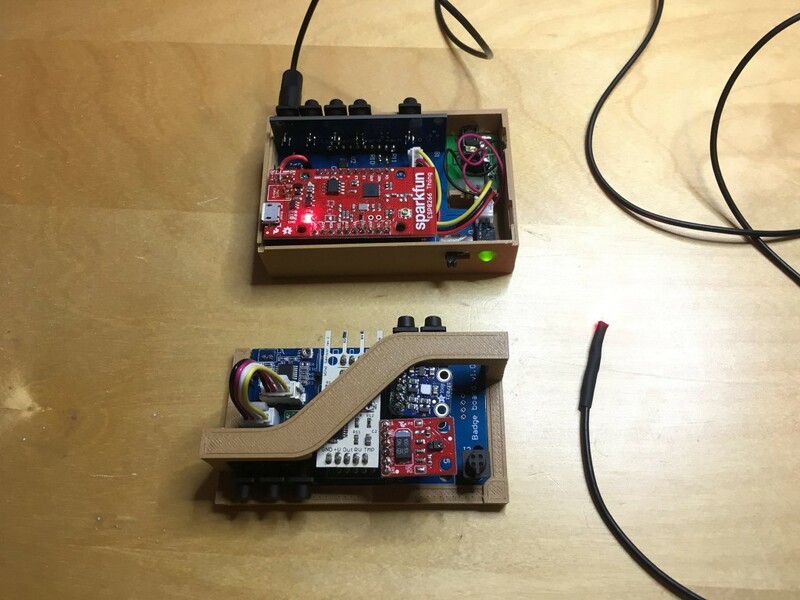 He has been working on what he calls Light instruments: LED light systems that can be programmed and played like a musical instrument. With his instruments he wants to go beyond mere functionality and use light for expression and experience. Our goals and explorations were a perfect match. I will be using his 9 x 9 mosaic instrument. It can make all colours and make beautiful and unexpected colour transitions. Also interesting is that it has been tested as tool for relaxation by master student Nina Oosterhaven (1). Her study showed for example that looking at changing patterns of light showed a significant reduction in heart-rate. So there are interesting starting points to work with the instrument. The light instruments are of course very specialized and not commercially available. So Tom kindly also supplied me with a Philips Hue Go. This will enable me to try out similar settings with a consumer device which is already Internet of Things ready. In the various articles I read I was looking for settings in light colour and intensity that would either relax or activate people and make them alert. There hasn’t been much research on the psychological effects of lighting. 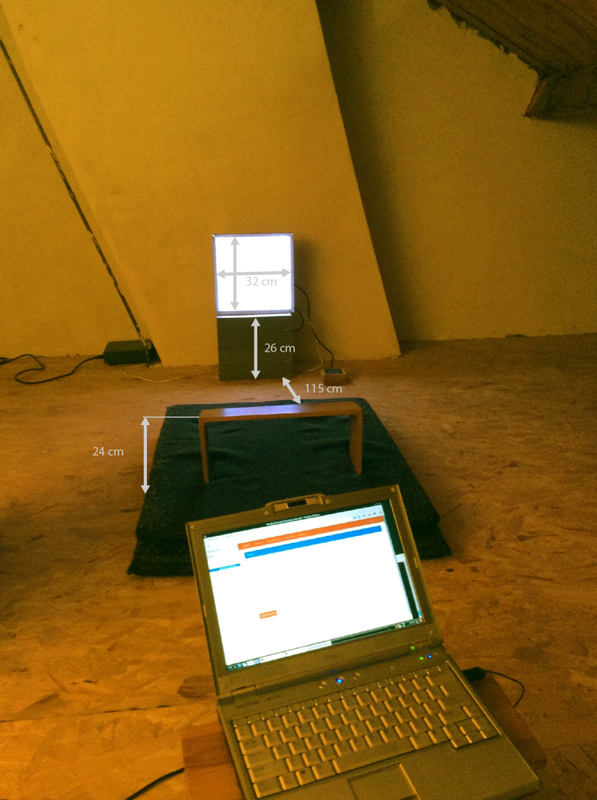 Seuntiens and Vogels(2) have done research on atmosphere and light characteristic in living room settings with a group of light designers. They looked at four types of atmospheres of which activating and relaxing are relevant for Meditation Lab. Interesting were their findings on the influence of colour temperature, brightness and dynamics on these atmospheres. In general the findings were: warmer (+/- 2700 Kelvin), static and less bright light (180 lux) is perceived as relaxing. Cooler (+/- 3800 K) and brighter light (390 lux) is perceived as activating this light can have a slow dynamic. Jacques Taillard et al (4) studied the effects of blue light on staying awake whilst driving a car at night. They compared the effects of continuous blue light to drinking coffee. When compared to a placebo both coffee and the blue light condition reported significantly less inappropriate line crossings with coffee doing only slightly better then blue light. The light source was a Philips GOLite with a wavelength of 468 nm. Luminance level was around 20 lux measured at eye level. Sleepiness, tension and lack of focus are challenges you face when meditating. By experimenting with different types of light I want to find out if the findings in other areas can be used in a meditation setting. I will use warm white light for relaxation, cool white light for focus and blue light for alertness. I will be exposed to one light condition per 20 minute meditation session. Before and after every session I fill in the standardised questionnaires which I have designed. I have started single person experiments (n=1) and I have designed the following experiments. There is no baseline measurement included in the single person meditation session. Instead I have conducted 54 baseline session under my usual meditation conditions. I did a 6 day solitary retreat at home. The sessions took place throughout the day, I didn’t manipulate anything, especially not the light conditions. So they varied widely as the day progressed. At the moment I’m conducting n=1 experiments using the Light instrument and the three main light states described above. I’ve set up a darkened lab to control the light conditions. I keep my eyes slightly open with my gaze turned down. My first impressions are that there is a difference from what I normally experience during meditation. The white lights I find quite relaxing and somehow invigorating. The blue light I find less pleasant and a bit depressing. I suppose the light will interact with my overall state of focus, sleepiness and alertness as it fluctuates during the day. That is why I try to do the experiments at different times of the day while using the same light setting. I do worry a bit about my sleep when meditating in the evening in bright light. For that reason I have turned down the brightness (there a 5 settings) in an effort to not affect my sleep too much. The single person experiments are my starting point. Later I will report on my design for group experiments. I’m always on the lookout for people who would like to join the experiments. So please leave a comment if you want to participate. 4) Taillard J, Capelli A, Sagaspe P, Anund A, Akerstedt T, Philip P (2012) In-Car Nocturnal Blue Light Exposure Improves Motorway Driving: A Randomized Controlled Trial. PLoS ONE 7(10): e46750. I suppose the answer to that question is obvious but not so easy to realise: during a retreat. But still, that is what I did. Last week I spend 6 days meditating while at the same time putting my brand new wearable and software platform to the test. For those of you who missed it: the past 3 months I’ve been working on the Meditation Lab Experimenter Kit. The focus on those first months has been to design and develop a new Silence Suit wearable, improve the electronics and create a software platform (the Data Server) to log and explore the data. The whole team has been working really hard to get the prototype ready for single user testing. It was quite exciting to put all the different parts together which have been developed by different team members on separate locations. I managed only just in time to get everything to work for the start of my self conducted retreat. The main goal was to gather as much baseline data as possible. At a later stage I will try to influence my meditation through manipulating the light. 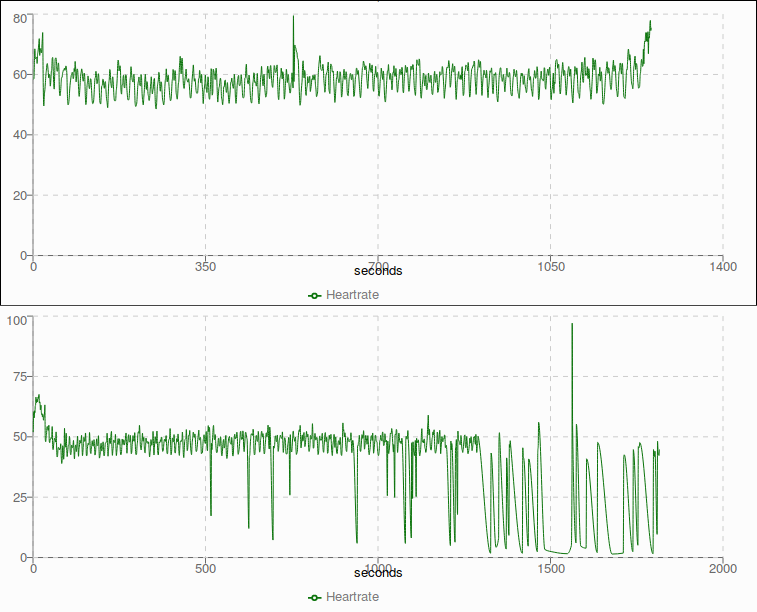 But to really see the effects I need insight into how my ordinary meditation data looks. So German, our AI and data science expert, advised me to get as many 20 minute sessions as possible. I managed to do 54! Do all the sensors produce reliable data? How stable is the software platform? How easy is it to use the wearable and the platform? Will I enjoy using both? Because I had been working with most of the sensors in my first prototype I had a pretty good idea of what the data should look like. Programmer Simon had swiftly put together a script that could plot data from all the sensors in graphs. That way I could easily grasp the main trends. It immediately became clear that the heart-rate sensor wasn’t doing what I’d hoped. A lot of beats were missed, once even only 2 data points were collected in 20 minutes (and no, I was not dead). Oddly enough the rest of the data was fine. I tried recharging the batteries and changing the ear clip but nothing worked and whether or not I’d get good data seemed unpredictable. Until the final day. While looking at the graphs after I’d finished a session I casually rubbed my earlobe and it felt cold. I looked at the data and saw that the signal deteriorated towards the end of the session. Eureka! The blood flow to my earlobe was the problem, not the electronics. Cold is a major influence but I also want to experiment with the tightness of the clip. It might prevent the blood from circulating properly. So most sensors performed well, better even than I’d hoped. Unfortunately no data comes from the cute little PCB one of the students at Design Lab has designed and soldered. Also the soft sensor for detecting sitting down (also the start button) is still unstable. The software runs on my old Dell laptop and Simon has installed the Lightweight X11 Desktop Environment (LXDE) on it. So it runs on Linux which was a new experience for me. But I like it, it is basic and simple and does what it should. To start the system I have to run the server for data storing and the adapter for communication with the hardware. I must say I am very impressed with the whole performance. There has been no data loss and the plots are great to get an impression of the session. I was pleasantly surprised by the comfortableness of the suit even after 10 sessions in one day. Putting it on with attention takes about 2 minutes and then you’re all set. You hardly notice that you are packed with 10 different sensors. Maybe it is just me but I don’t mind filling in two forms for every session. I seriously consider every question and try to answer as honestly as I can. Doing two or three session in a row is even easier. All I have to do is refresh the home page of the server and I can start another session. Well yes, using the system was a pleasant experience for me. I did learn that I should not look at the data before filling in the post meditation questionnaire because the data caused my mood to plummet. So it will be best to have the data summery after that has been done. Session summary. The number of data points will be replaced by mean values. I have a lot of confidence that the system will be useful and give a lot of insights. There is still a way to go until I can actually automate the light actuation intelligently. But the plots did show variations and now German can work his magic. I can’t wait to see what he will come up with. Last week Danielle had her mid-term evaluation from WEAR Sustain. I found it interesting to hear about it because as a part of my internship I am also interested how the dependency on a grand feels. She had to show the progress of the project so that the financier can decide if there are enough steps made to further sponsor it. Danielle was very aware of the fact that the project cannot proceed if the jury does not see sufficient progress. So the days before, the deadline influenced the workflow. We worked extra hard to bring things together so that Danielle could present the suit with all the sensors detecting data while presenting. Everyone invested extra much time and energy to reach the deadline. But as you can imagine we did not reach our goals in one step. Vera de Pont came in the weekend to fit the suit and to adjust the last things. For example she had to fit the breathing sensor which has to sit very tight to detect the data correctly. Danielle and Vera had to add all the cabling and every sensor to the suit to make the suit a Silence Suit. They worked the whole day until late in the evening to bring it all together. The next day Simon de Bakker from Proto Space came to install the software on Danielle’s laptop. So that she could start with the baseline measurements and present the whole suit in action to the jury of WEAR Sustain. But that seemed more difficult than expected. The software could not work be installed the laptop. Simon had to create a Windows installation so it could run on her laptop. 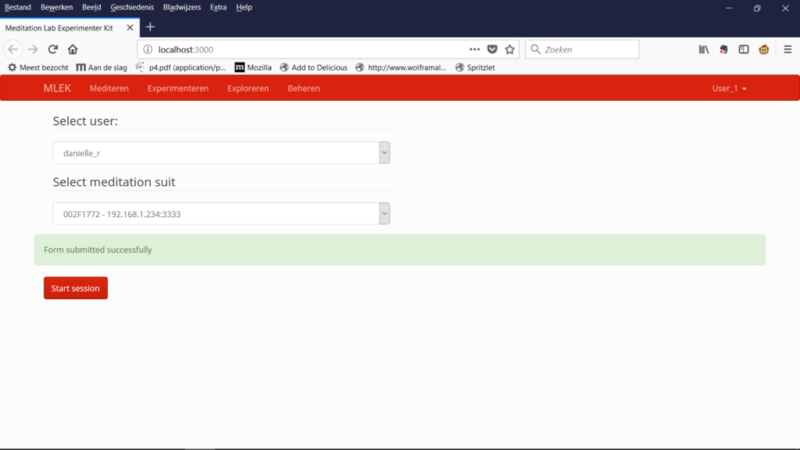 It cost much time but after two days it was possible to create a profile, connect to a suit, to start a session and fill in the questionnaire. The only problem was still that the detected data were not right. Only the wind sensor and the breathing sensor worked acurately. The other sensors also send data to the server but they were incorrect. Last weeks we had a great time working hard on the paper we wrote about the collaboration in a multidisciplinary team. All team members worked hard on the next prototype of the Silence Suit and we made great steps to realize it. But first, I want to tell you more about the paper we wrote. As a reaction to the call for papers from the Design Research Society, Danielle and me decided to reflect on the collaboration in this project. We decided that it goes very well and wanted to research if Danielle’s artistic vision of Hermitage 3.0 is stimulating the team member’s motivation in a positive way. We formulated a survey every team member answered to verify our hypothesis. These hypothesis were created by our reflection. While Danielle reflected on her own role and how she subjectively experience the collaboration, I took the role of an observer to reflect on it from a third angle as onlooker. It was a really intensive time because it was very hard to formulate our hypothesis and our questions that clear, so we can compare it to the answers of the survey. First, it went very naturally. I did some research about the contemporary artist and compared it to Danielle’s art practice. Danielle read articles about the collaborations and how designers communicate within a collaboration. We saw some parallels with how our collaboration goes and talked about it. Later, it became more complex. We had some hypothesis and questions we still wanted to research. But what does our hypothesis mean in the bigger whole? While I found it easy to zoom in on the artistic practice, I found it more difficult to zoom out at the end to see the relations with the main question to formulate a conclusion. It was noticeable that Danielle was the leader within this collaboration of writing the paper. I realized that she is experienced in reflecting and formulating her hypothesis in an academic way. Reflecting on how I worked on the paper, I noticed that the art school context is very different from the real world. Criteria for an artist as open minded and innovative seem obvious to me looking at my classmates. Danielle told me her experience with colleagues who finished art school but still work conservatively. I wonder if these people are artists in my eyes. In the end I am really happy about the result of the paper. Even if there are some things we could further reflect on to get it more precisely, we made great discoveries. We concluded that there are objects needed to communicate with people from different disciplines. They are named boundary objects because they help the team members to cross boundaries. We also learned that the artistic vision of the project stimulates some team members to cross the boundaries of their own expertise. We believe that Danielle as person and as an artist stimulates also the dynamic of the project. But that is an aspect which is worthy of further research. The writing of the paper was an extraordinary experience for me to work together on one text. I learned how difficult and important it is to understand each other thoughts in the way that you can think further on the thought of another. We have submitted the paper for review by the Design Research Society. We will know if it is accepted by the end of January. We’ll keep you posted. Because we were so busy writing the paper I had no time yet to tell you about our last visit to Design Lab where three students from University Twente: Stephen, Klaas and Jelmer, are working hard to realize the electronics, 3D printed housing and the firmware for Silence Suit. 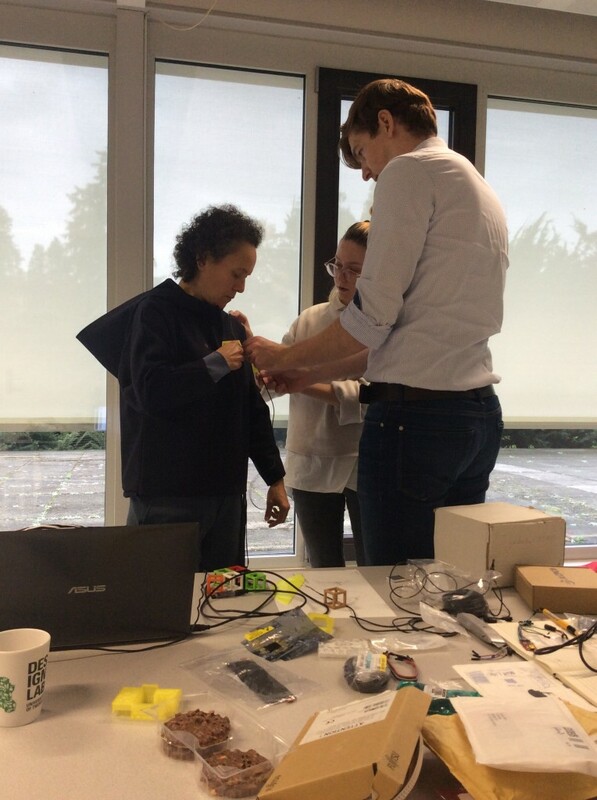 Vera de Pont, the designer, went with us to look how the wiring and the sensors have to be included in the suit. The meeting itself seemed a bit chaotic to me because there was no main focus. Later, I realized that there cannot be a main focus because everyone is working on his own aspect from his own expertise. While Vera and Danielle tried on the suit, Stephen, Klaas and Jelmer worked on the PCBs and casing. And while Danielle spoke with Stephen, Klaas and Jelmer about technical details, Vera tried to effectuate the first adaptation. I noticed that Danielle took the cross over role between these two different work-fields, between design and technology she was the artist. Generally, many things do not work from the beginning. So you have to make many trials before the result fulfils your expectations. That is something I really learned from my intern-ship and it is still something I have to work on. Personally, I want to do it right in one step. But obviously that is not possible with such a complex project. That is also why the meeting in Twente seemed that chaotic to me. In the end, I had the feeling that we did not reach our goals, because many things did not work. Now, some weeks later, I realize that these trials (I knowingly do not want to name it mistakes) were essential to come where we now are. The first PCBs are ready, the badge for the environmental sensors and the box for the micro-controller are 3D printed and they look beautiful. The software and the suit itself will soon be ready. Then we have to bring together the suit with the wiring and the sensors. The next step will be to meditate as much as possible to get enough data to program the software intelligence which has to operate the light instrument. It is a exciting time because now, things really have come together.